Mistakes in wine cellar construction are common. The wrong choice of material and improper installation will make or break the functionality and appeal of your wine cellar. Your flooring must not be neglected. You must work with a professional to ensure that your flooring will suit your storage needs, budget, and style. WholeCellar works with Wine Cellar Specialists in installing stylish and durable flooring options. 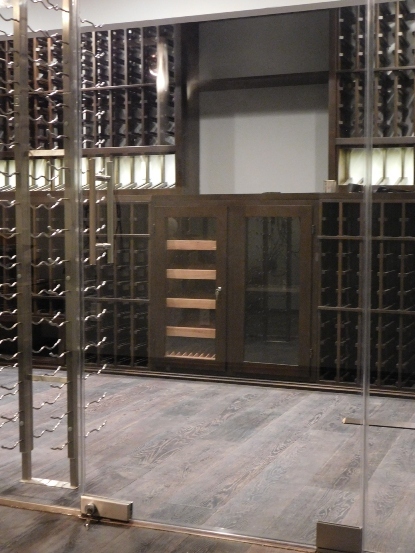 When building a climate-controlled wine cellar, the installation of the flooring requires a professional. It plays a significant role in creating a stable environment for long-term wine storage. When poorly installed, it can cause serious problems in the future. 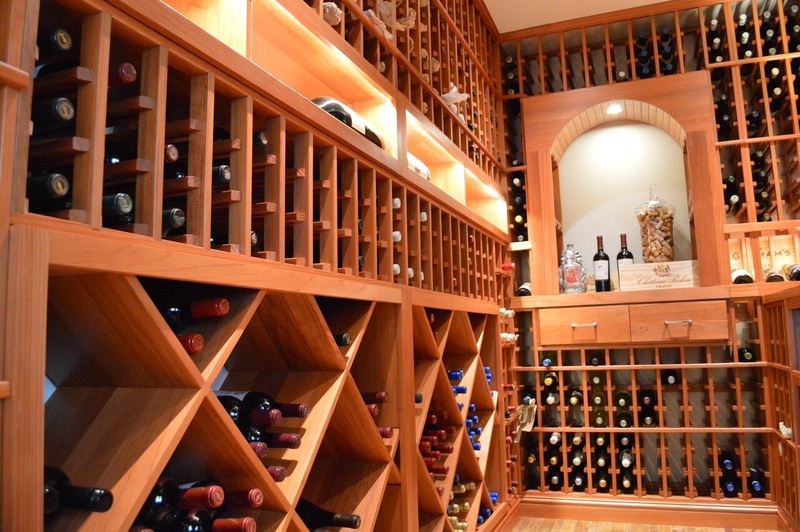 You must work with Wine Cellar Specialists, one of the top-notch builders in Texas. A refrigerated wine cellar has humid conditions, so you have to be careful when choosing your flooring material. Keep in mind that using a carpet is a no-no. This is because it can be a good breeding place for mold and mildew in damp conditions. The common materials are tiles, vinyl, and slate. However, we recommend cork and wine barrel for your flooring. For many years, there has been an increase in using sustainable materials to help save our Mother Earth. Most designers and builders recommend renewable or recyclable materials. Cork is the bark that is harvested from cork oak trees found in northwest Africa and southwest Europe. Harvesting cork does not require cutting of trees. The proper way of stripping the bark will not affect the life of the trees. A protective inner layer of the bark allows the trees to regenerate growth every 9 to 12 years. Cork is a great material for making wine bottle stoppers because of its buoyancy, impermeability, and elasticity. Another amazing use of cork is for the flooring. 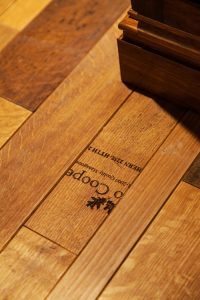 WholeCellar and Wine Cellar Specialists recommend the cork flooring because of its unique characteristics and cell properties that make it ideal in wine cellar conditions. 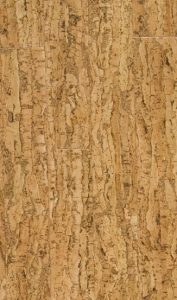 Cork contains suberin, a waxy substance that inhibits mold growth and prevents the material from rotting. Suberin also makes cork highly resistant to extreme heat or fire, hypoallergenic, and able to keep away mites and bugs. Cork has natural micro rubber particles that lengthen the lifespan of your flooring. It is made up of 50 percent air, which helps it withstand pressure. It is a lightweight, yet durable material. In fact, it can last for decades if properly maintained. Our natural cork flooring is milled using the “Click” technology with a tongue and groove center core. It helps create a tight connection between planks without using glue. It also makes the installation quick and convenient. Additionally, it also makes repair easier. Cork’s ability to withstand temperature changes and resistance to moisture make cork an ideal material for wine cellar flooring in Texas. Its closed and bubble-form cell structure makes it a natural thermal insulator. It also reduces noise and vibration because it offers a cushion effect. When it comes to visual appeal, cork flooring offers a variety of colors, patterns, and sizes. You may opt for tiles or planks, depending on how you want your flooring to look. You can even use alternate tones or colors for a striking effect. Cork floors also blend well with any décor. Lighter shades achieve a casual look, while dark tones are ideal for formal settings. With limitless design possibilities offered by cork, Wine Cellar Specialists can create a truly unique flooring for your space. 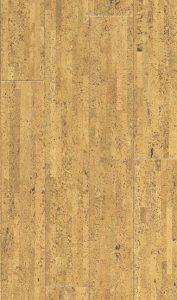 We offer Almada cork flooring. It is certified by Greenguard Children & Schools for maintaining indoor air quality. This means that this product does not introduce harmful emissions into your home. It is also easy to install. Unlike other flooring options, Almada cork flooring can be installed without the use of glue or nails. We use beveled narrow planks to make your flooring appear like natural hardwood. The core flooring is moisture resistant exterior grade high-density fiberboard. This provides better insulation, which can help in maintaining a stable environment in your wine room. 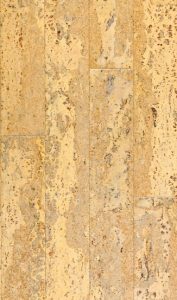 Our Almada cork flooring collection is available in Fila Natural, Nevoa Natural, Tira Natural, and Marcus Natural. Another popular flooring option is wine barrel flooring. Oak barrels are used to age wines for many years. They impart distinctive flavors, tint, and texture to the wine. After about 3 years, the used barrels can be recycled. Instead of selling them as firewood or putting them into the landfill, they can be turned into something that can beautify your wine cellar. Reclaimed wine barrel flooring is not only environment-friendly. It also adds an historic touch to your wine cellar. At WholeCellar, we utilize the top, inside, and outside parts of the barrels, so nothing goes to waste. We break them into long strips and engineer them so we can make exceptional flooring for our clients. The vertical wood that makes up the barrel sides are called Stave. The distinctive markings left were from the metal hoop bands of the barrel. The Cooperage style flooring is made from the wood of the top and bottom parts of the barrel. It shows the markings and cooper stamps, which are used to identify the original contents of the barrel and the logo of the winery. If you want your flooring to display the “wine-stained” part of the barrel, the Infusion style is a perfect choice. The planks, which were naturally infused by the wine, have various shades of reds. We use the tongue and groove when installing wine barrel flooring. The planks are 5/8” thick and available in random widths and lengths. The flooring is micro–beveled and pre-finished in sealant. With an aim to make every wine cellar design exceptional and be eco-friendly at the same time, WholeCellar and Wine Cellar Specialists offer the best flooring options: cork and wine barrel flooring. Start your project today! Contact us at +1 (844) 608-4199! An interior designer was looking for an experienced company to help her build a traditional home wine cellar. She hired Blue Grouse Wine Cellars, one of the most reliable master builders in Vancouver, Canada. They needed to utilize wine racks made from wood to achieve a timeless appeal. Learn more about the features of this wine cellar. The customer had a design plan in mind. She wanted Blue Grouse Wine Cellars to build a wine cellar that utilizes traditional wooden wine racks. She requested the wine racks to be darkly colored to match the modern theme of her luxurious home. The flooring, ceiling, and lighting fixture are her personal choice. Being in the construction industry for more than two decades, Blue Grouse Wine Cellars is very experienced. They can anticipate what concerns the client may have. They always do their best to meet the functional, aesthetic, and financial needs of every client. They are ready to guide homeowners in determining the perfect wine storage solution for their space. On this project, the room was small and is narrow like a hallway. It has a height of 96 inches, a width of 102 inches, and length of 87.5 inches. The space is similar to a cathedral because the ceiling at the center is higher than that of the sidewalls. The metal chandelier hanging from the middle ceiling added a contemporary appeal to the wine cellar. Before creating the 3-dimensional drawings, Blue Grouse Wine Cellars always makes sure that the images will provide the customer a better visualization of the completed wine room. To achieve this, they made a careful assessment of the client’s requirements, taking note of every detail. In this crucial step in building a wine cellar, they need to know the size of the collection and bottles and the overall ambiance that the owner wants to achieve. Additionally, it is also significant to know whether the client buys her wines by the bottle or in bulk cases. After taking note of all of the requests of the designer, Blue Grouse Wine Cellars implemented them into the design. The 3D images included the various elevations, dimensions of the racking, different bottle orientations, and bottle capacities. The team of Blue Grouse Wine Cellars recommended custom features for the racking. Both the left and right walls have the same bottle orientations. They combined different racking styles to add functionality and offer maximum storage capacity. They also made sure that the overall design is visually appealing. Blue Grouse Wine Cellars added an arch and countertop, a common feature in most wine cellars in Vancouver. It adds character to the wine room. The client can use the countertop area to store and organize a few bottle and wine cellar accessories. Your choice of lighting can make or break the ambiance of your cellar. On this project, the top of each archway has a spotlight, which highlights the objects on the tabletop. Since the owner loves to buy wines in cases, Blue Grouse Wine Cellars thought that adding diamond and case storage bins would provide a better way to display and organize the bottles. The diamond bins store the bottles one on top of another. The owner can use each section in the diamond bins for sorting the bottles according to variety, style, or size. The rectangular bins allow for storing the client’s bottles in wooden cases. Each of the three shelves can store two cases. The individual wine racks can store 750 ml bottles. Blue Grouse Wine Cellars added the openings on both sides of the arch (top section) and the diamond bins (bottom section). This type of racking displays the bottles with the cork or cap facing out. There is a display row in the middle section of the racking, on both sides of the arch and tabletop. It pitches the bottles at a 15-degree angle to keep the cork moist. Dried cork will cause an unwanted amount of oxygen to get into the bottle and mix with the wine. When this happens, wine will deteriorate due to oxidation. The wine rack material is another factor that affects the overall appeal of your wine storage facility. At Blue Grouse Wine Cellars, they always make sure that they manufacture wine racks from high quality and attractive material. On this project, they used Knotty Alder, a popular wood species widely used in the construction of wine racks. It exhibits beautiful clusters and knots, and adds a rustic appeal in wine cellars when stained and lacquered. With the proper choice of lighting, you can illuminate your wine display area with visual appeal. Also, your wine collection will be protected from heat damage. Regular bulbs can damage your collection because they emit excessive heat and UV light that can affect the taste and aroma of the wine. On this project, Blue Grouse Wine Cellars used the LED (Light Emitting Diode). This type of lighting system is ideal for refrigerated wine rooms because it does not emit too much heat. It also has a longer lifespan than incandescent and fluorescent bulbs. If you want to convert an extra room into an elegant and safe home wine cellar, you must work with a master builder. Blue Grouse Wine Cellars designs and builds custom wine rooms in West Vancouver and the surrounding areas. Contact them today at 604-929-3180. 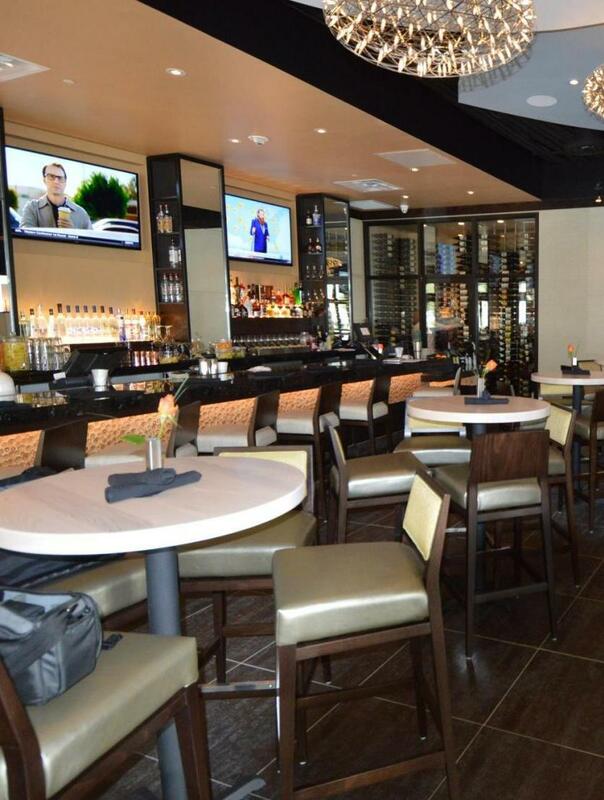 The owner of one of the most prestigious restaurants in Richardson, Texas, needed help in building a modern and impressive wine cellar next to the bar and dining area. The owner wanted to attract customers to purchase their wines. For many years, Wine Cellar Specialists, one of our dealers in wine cellar construction, has been helping commercial establishments that sell wine, boost their sales. Commercial wine cellars are in demand, not only in restaurants, but also in hotels, bars, and retail stores. The benefits they offer to the owners include proper product presentation, better organization of wines, optimum storage, and increased revenue. If you’re a restaurant owner, a proper and exceptional presentation of wines will help drive more sales by attracting potential customers. A mediocre wine display will not catch the attention of the clients. They may dine in your restaurant, but may not take the time to check out the wines stored on regular shelves in the bar area. With a stunning wine display, you are providing the diners a good perception of your products. It will encourage them to take a look at your wines in stock and may end up in a purchase. Experts don’t recommend storing bottles in cardboard boxes or ordinary shelves in your restaurant. You can better organize your wines in stock according to size or variety if you have a well-designed racking system. Commercial wine racks will maximize the storage capacity of your space. 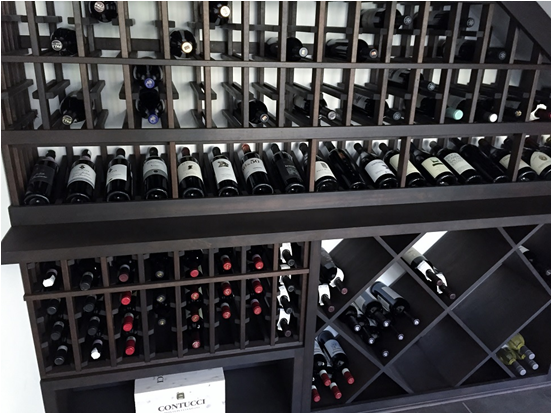 Ask your builder to customize your racking, so it perfectly fits your wine room and the various bottle sizes in your collection. 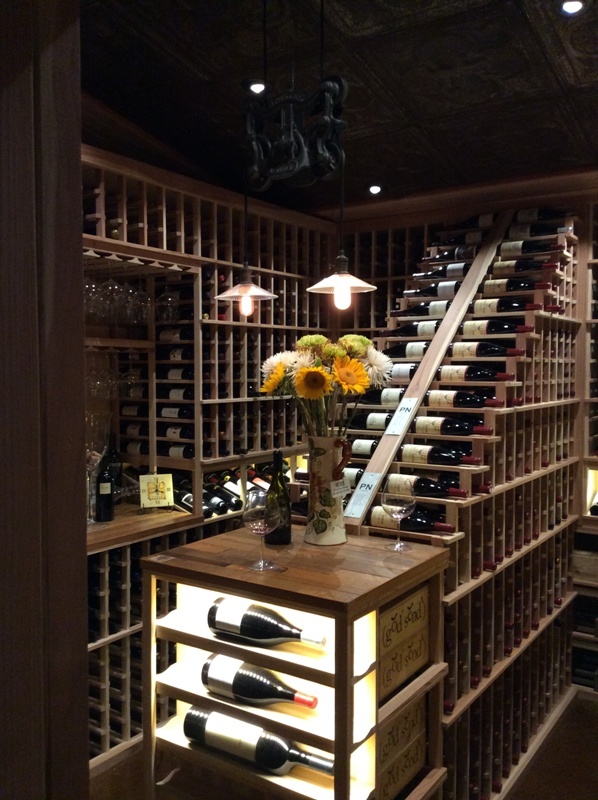 Wine Cellar Specialists, an experienced builder of wine rooms, recently completed a contemporary wine cellar installation project in Jasper’s Restaurant. 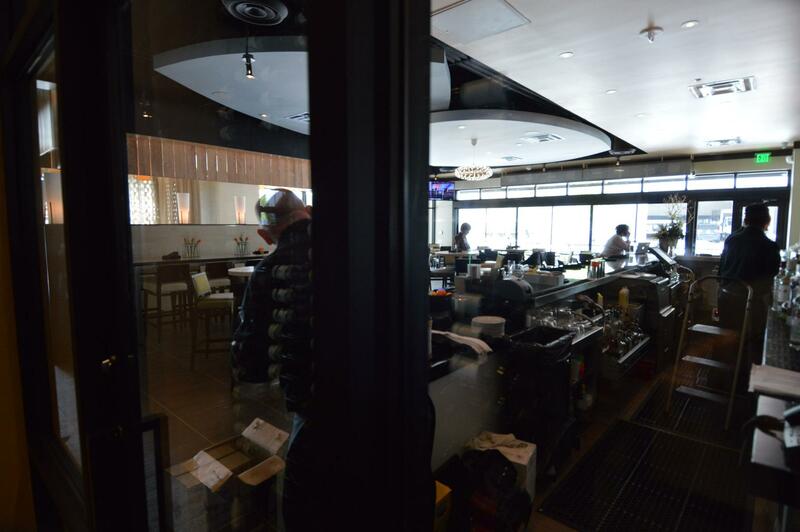 They had to utilize the room next to the bar and dining area of the establishment. 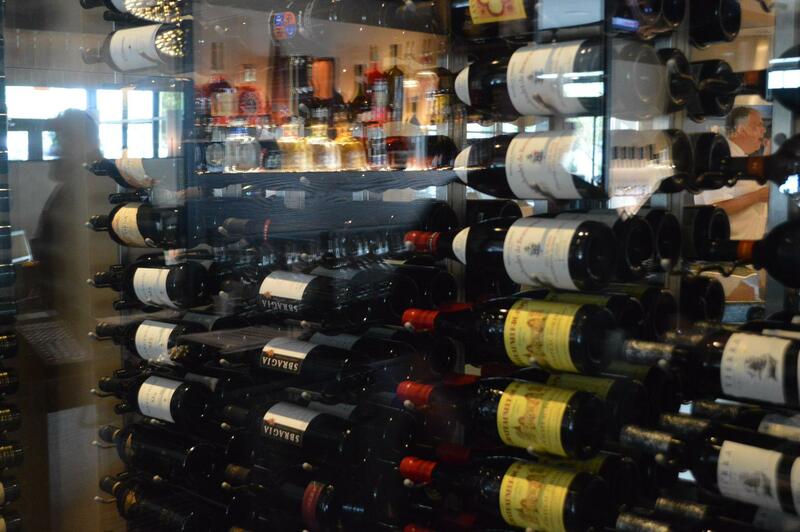 The wine room can display a total of 864 bottles lying on their sides. The architect of the restaurant provided Wine Cellar Specialists with the dimensions of the room. The features of the wine cellar include black anodized aluminum framing, sleek metal racking, and glass enclosure (dual panes and tempered). The type of wine racks you use to showcase wine products has a significant impact on the overall sales of the restaurant. 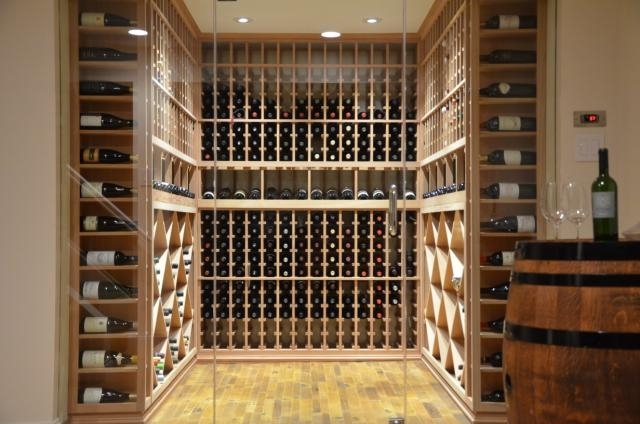 At Wine Cellar Specialists, they always make sure they provide a racking solution that will suit the size of the room and aesthetic needs of the client. On this project, they utilized Platinum Series metal wine racks from Vintage View. Metal is the most suitable material for commercial wine displays. Its minimalist appeal can bring any-sized room into a wine cellar that can “wow” customers. When you enter this commercial wine cellar in Richardson, Texas, the first set of wine racks that greets you has a floor to ceiling height. It is a triple-deep storage unit and is visible from the bar and dining area. At the other side of the glass panel is a single-bottle deep storage rack. When facing the front racking, the wall on the left consists of wall-mounted metal wine racks that are also 3-bottles deep. This type of racking (wall-mounted) can bring any bare wall to life. Additionally, it does not occupy floor space, making it ideal for tiny wine rooms. At the back section of the wall is another single-deep wine rack, also mounted on the left wall. Vintage View is one of the most reliable providers of innovative racking solutions. 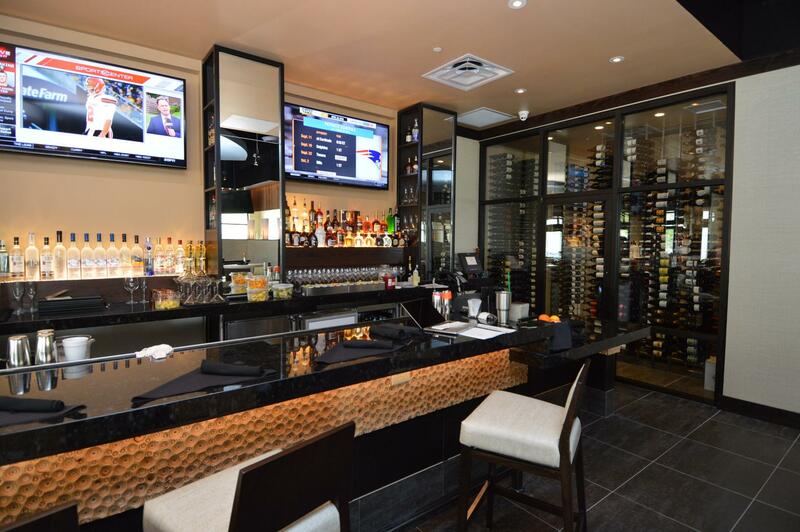 Their wine racks suit the needs of restaurant owners who want to have a wine cellar with contemporary features. 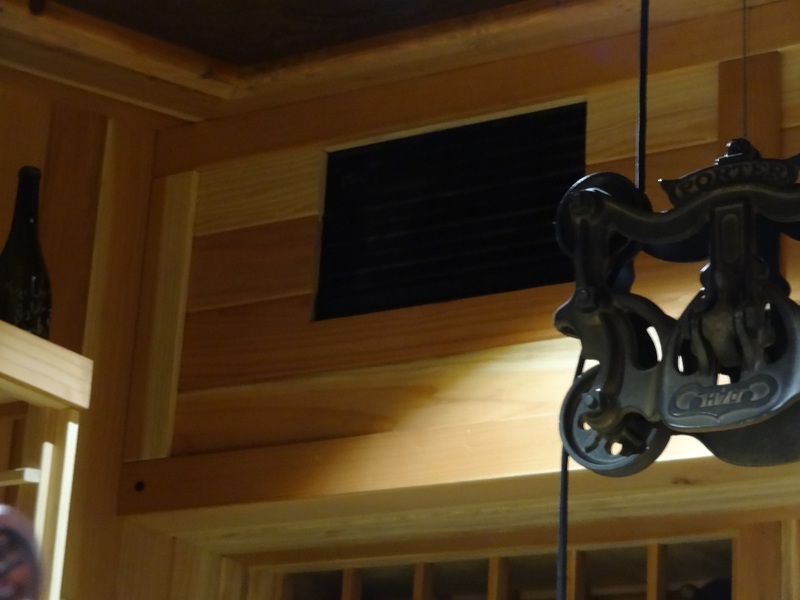 When it comes to durability, Vintage View wine rack systems are a top choice. Their label forward orientation provides easy access to wines. Since the wine labels are facing out, the customers don’t need to spend much time looking for a specific type of wine. With other wine rack designs, which hide the labels, the clients will need to pull out the bottle from the rack. This will disturb the wine’s sediments and may alter its flavors. Moreover, Vintage View wine storage units also provide convenience for easy wine inventory and management. Every cellar must have a reliable climate control system to ensure that the wines will reach proper maturation. Without it, wine on sale will deteriorate easily. When this happens, your restaurant will have a bad reputation to clienteles. Customers who bought a bad bottle of wine from your restaurant may never purchase again in the future. They may even spread the news to their friends and colleagues. This will have a negative effect on your business profit. It is very important that you seek the help of a wine storage expert to help maintain a stable environment in your wine cellar. After all, the quality of your products will reflect your business. 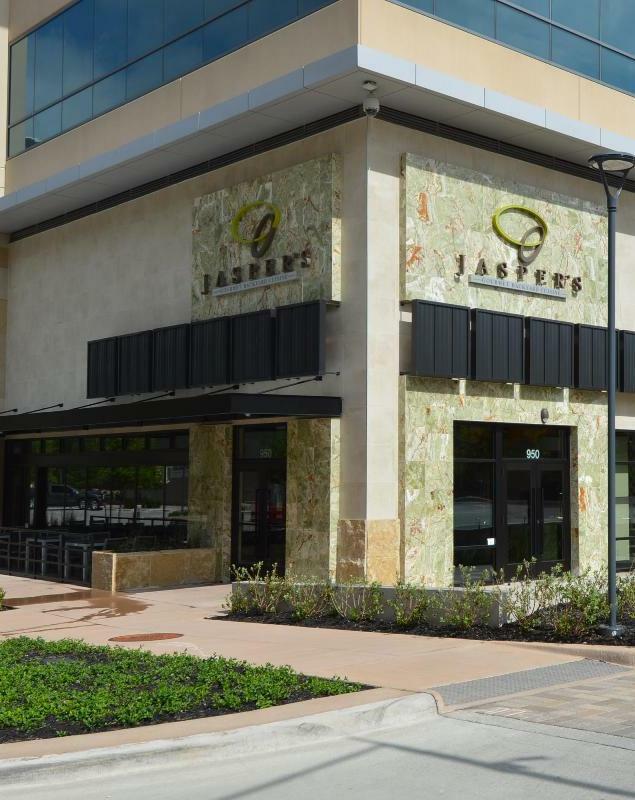 A careful assessment of the client’s needs helped Wine Cellar Specialists determine the correct cooling system for Jasper’s Restaurant walk-in wine storage room. The refrigeration unit used for this commercial wine cellar construction project in Richardson, Texas, was the HS (High Static Series) 10000 model manufactured by US Cellar Systems. It is a ducted split system, so there was a need to connect the unit to ductwork. Wine Cellar Specialists placed the evaporator above the ceiling for ease of maintenance. This also helped maximize the room’s capacity because the equipment does not occupy any space in the cellar. The supply and return vent are also in the ceiling. A ducted split wine cooling system is also recommended for restaurant owners who don’t want a visible piece of equipment in their cellar. Since the compressor (the noisier component of the refrigeration system) is on the upper level of the restaurant, there is minimal noise in the cellar. Invest in a High-Quality Wine Display in Your Restaurant. Work with an Expert. Display your wines with elegance to increase the profit of your restaurant. Wine Cellar Specialists designs and installs commercial wine cellars in the Texas areas, including Richardson, San Antonio, and Dallas. Call them today at +1 (866 ) 646-7089! 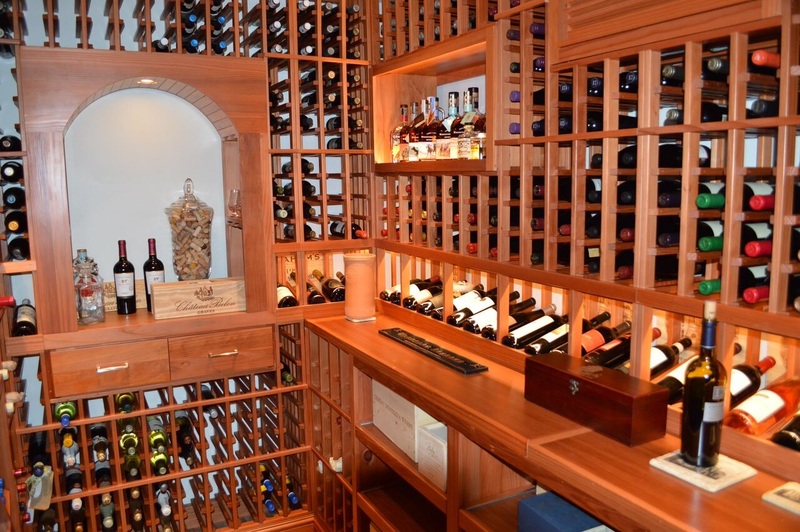 A homeowner in La Jolla, California, had a custom wine cellar that was built in 2008. However, his growing collection required a larger wine storage space. He approached Vintage Cellars, one of our most trusted dealers in wine room construction, to add new sections to accommodate more bottles. Learn how this awesome project was completed. 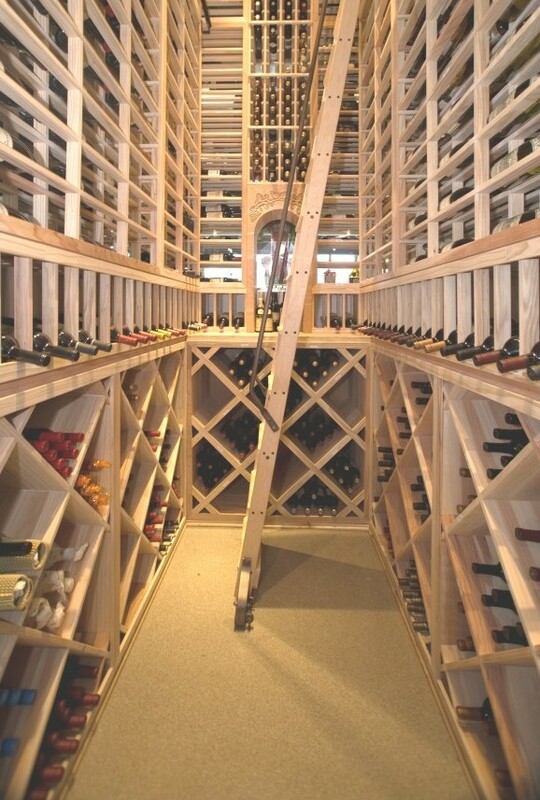 Challenges cannot be avoided when building a residential wine cellar. One of these challenges is to create a design that will accommodate the growing collection of the homeowner. Vintage Cellars, one of our wine cellar dealers, built a custom wine room for their customer who lives in La Jolla, California. The first installation was completed in 2008. After 5 years, they started the second installation for the expansion of the wine cellar because the owner loves to buy wines in bulk. Vintage Cellars needed to double the size of the existing wine cellar to accommodate the growing collection of the client. 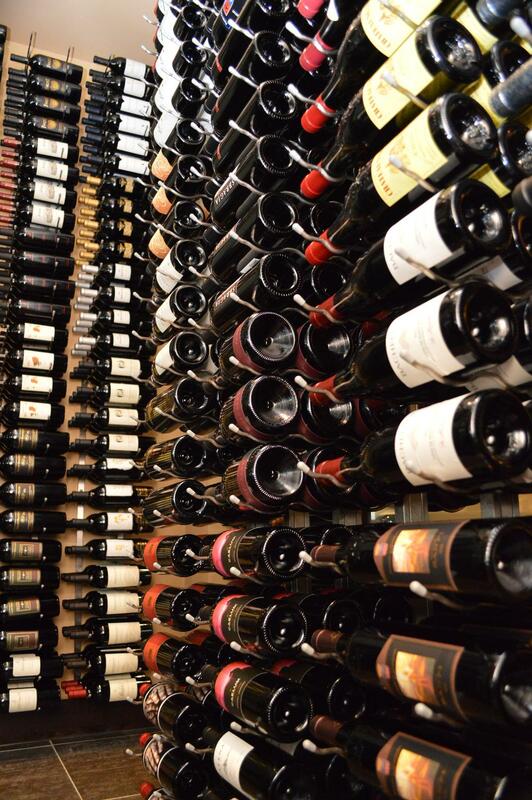 The original wine room could store 1,100 bottles. After incorporating various racking styles and adding new sections to the racking, they were able to provide a storage space for 1,624 bottles of different sizes. The client’s home interior was built with wood and glass. All of their furniture and cabinetry were made of Sapele Mahogany. This wood has a medium to reddish brown color, which makes it a favorite construction material for wine racks. When stained, its grain patterns look more attractive. The contractor and architect of the house gave Vintage Cellars a palette to match the existing woodwork. Stability and durability are other characteristics of Sapele Mahogany. It is also safe to use in climate-controlled wine cellars in La Jolla, California, because it is scent-free. This will prevent unwanted odor from affecting the overall quality of the wines. CAD drawings were created to provide the homeowner a better visualization of the completed wine room. The 3D images, which are in black and white, show the dimensions of the room, wall elevations, and bottle capacities of the wine racks. On this project, Vintage Cellars widened some of the racking sections and added new bottle openings for increased bottle capacity. 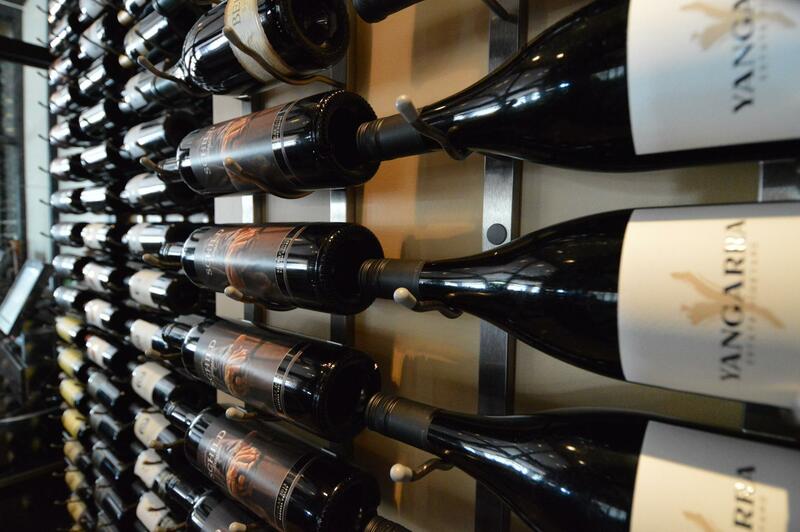 Upon entering the wine cellar, the racking to your right is Elevation 1. A VC-style cover was placed at the top section to conceal the evaporator of the wine refrigeration system. Individual wooden wine racks were installed on both sides. At the middle section, there were diamond bins, which allowed for bulk storage. Since the client collects large format bottles, Vintage Cellars needed to open up a couple of spaces below the diamond bins. They added coved trays, which could store larger bottles (as big as 9 liters). They were designed to display two bottles in each section, in cascading heights. With this racking style, the wine labels can be seen easily. There’s no need to flip the bottles to see the content and description. An LED lighting system was installed above the coved trays for a dramatic visual effect. This lighting system is a cost-savvy option because it consumes less energy than other types of bulbs. LED lights are also known for their longer lifespan. When it comes to safety, they can protect your collection because of their low heat emission. In the next area of this custom wine cellar in La Jolla, California, Vintage Cellars installed three columns of horizontal display wine racks. This section has a depth of 4 ¾ inches and has solid sides and fixed coved trays. Since the bottles were stored on their sides, the wine labels were facing out. With a depth of 8 ¼ inches, the middle section of this racking was designed to provide space for the client’s mini car and decanter collection. The glass shelves are adjustable for easy organization. To highlight and add appeal to this area of the cellar, mirror and lighting were installed at the back. Now, the racking in Elevation 2 can accommodate 117 magnums and 36 standard bottles. For the next wall, Vintage Cellars added three more sections of custom cabinets with scalloped neck supports and two sets of single bottle wine racks. After the expansion of the racking, the racking in Elevation 3 can hold 384 standard bottles in individual racks and 34 bottles in the custom cabinets. The weight of the cabinetry was very heavy. To ensure that the racking would not give up, Vintage Cellars installed large steel supports under the double-deep tabletop. The big space below the tabletop provided an excellent storage area for the client’s wines in boxes. The racking in the last two walls of the wine room was also expanded. In Elevation 4, the wine racks can now accommodate 98 magnum bottles. Another VC-style cover grill, which hides another wine cooling evaporator, was installed at the top section. After adding new sections, Elevation 5 now provides bottle openings for 288 wines in individual racks, 26 in the custom cabinets, and 16 in the coved trays. It’s difficult to access wines placed in high areas of the wine racks. 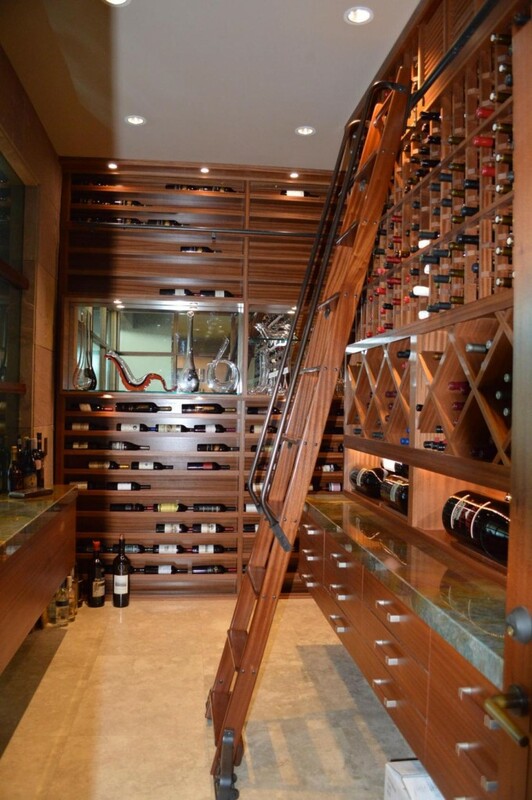 To provide the client convenience, Vintage Cellars added a hook ladder during the first installation of this home wine cellar in La Jolla, California. This type of ladder can be transferred from one wall to another wall through a railing that is attached to the racking. The owner needs to lift it if he wants to access hard-to-reach bottles in another room. Since the ladder was very tall, it would also be difficult to move it to another area in the cellar. Vintage Cellars decided to add a second ladder to allow easy access to the wines. Considering Your Own Project? We Can Help You. If you’re planning to start your own wine cellar project in La Jolla, California, Vintage Cellars can help you. Their designers and installers have extensive experience in the construction industry. Call them today at +1-800-876-8789! A storage structure uniquely designed by Coastal Custom Wine Cellars for a client in Irvine, Orange County, California. An ideal custom wine cellar is a storage room that is not only functional and dependable, but also masterfully designed. Since the storage structure will serve as a display room for prized wine collections, it should be built beautifully. Coastal Custom Wine Cellars, one of the top builders in California, recently completed a construction project in Irvine, a city in Orange County, California. The client wanted a residential cellar built that could accommodate wine bottles of various sizes. He also wanted his storage room to have an area for keeping liquor rather than wine. Coastal’s team of specialists designed and built the home cellar according to the client’s needs and style preferences. 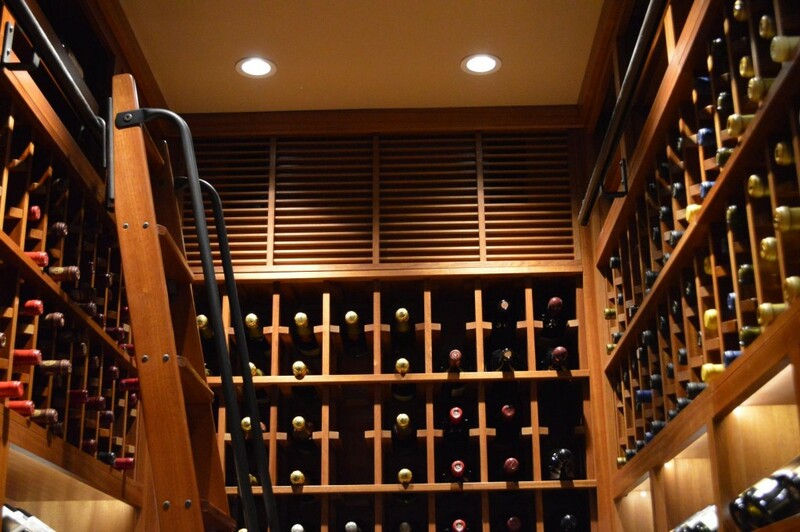 Coastal Custom Wine Cellars successfully completed a construction project in Irvine. The client wanted a uniquely designed residential wine cellar built. He wanted his storage room to be able to accommodate an assortment of wine bottle sizes. The team of expert builders from Coastal began creating the structure while adhering to the client’s design specifications. The client keeps his Bourbon collection, together with his prized wines, in this beautiful residential cellar. The client specified that his home custom wine cellar would not only store wine, but also other types of liquor. He wanted to have a space in the storage room reserved for his Bourbon collection. To meet the client’s request, the team of builders from Coastal included open bins on the cellar’s right side. These specially made bins were designed for storing other types of beverages rather than wine. On the left side of the cellar, the builders created a display row that could store large format wine bottles. Label-forward spaces were included, so that bottles can simply be cradled in the shelves. The racks can accommodate a wide range of bottle sizes, anywhere from 1.5-liter to 12-liter bottles. Both the left and the right sides of the wine room have shelves that were designed for magnum-sized bottles. The style of the racking in this Irvine home wine cellar is perfect for wine enthusiasts who enjoy collecting bottles of various sizes. Large format bottles that range from 1.5 liters to 12 liters can safely be cradled on these shelves. There is a beautiful tabletop in the middle area of the residential cellar. Above this tabletop is a gorgeous arch, and instead of a stemware rack, the arch has an inset on both its left and right sides. Each of these inset spaces is designed to hold wine glasses, upside down, by their bases. Each inset space can accommodate up to four wine glasses. A set of drawers is also included below the tabletop. The client stores wine tasting essentials, like napkins and corkscrews, in these drawers. The lighting in this Irvine custom wine cellar is stellar. Besides the rich and vibrant lights that illuminate the entire room, the concealed lighting adds a touch of elegance to the racking and makes the displays pop out grandiosely. The success of this residential wine cellar project is brought about by the healthy working relationship between the client and the contractor. There was adequate planning before the construction commenced, and there was open communication throughout the duration of the project. Since the client’s house was near the main office of Coastal Custom Wine Cellars, the storage specialists were able to visit the area easily. The expert builders were able to take accurate measurements of the space, thoroughly discuss with the client his options, present various wood finish samples, and provide as much comprehensive advice as needed. Because of this good working relationship, the client’s needs and design preferences were sufficiently met from the start of the construction until the end of the project. Want a distinct design for your residential wine cellar? Consult a professional storage builder now! Click here! This gorgeous wrought iron door with an elegant arch keeps this Irvine home wine cellar tightly sealed. perature and humidity in the cellar, and it can consequently cause the spoilage of the wines stocked inside. Besides dependability and functionality, a custom cellar door should also be beautifully made. 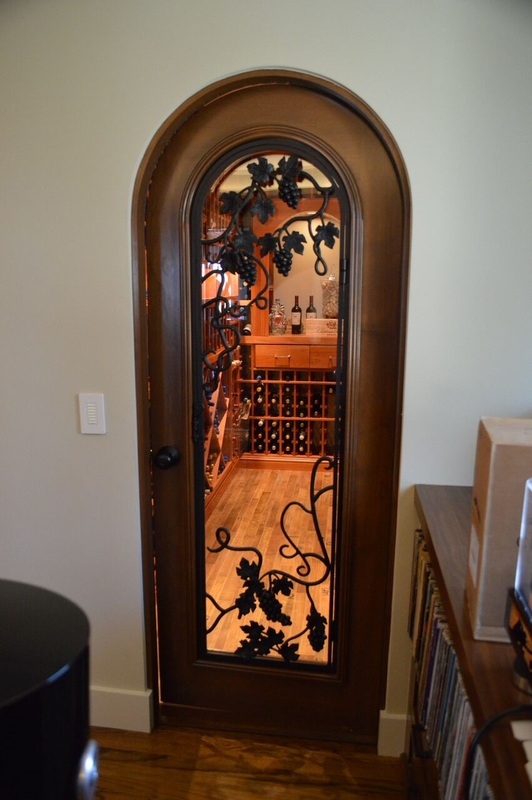 A well-designed door can increase the aesthetic appeal of a wine storage structure. 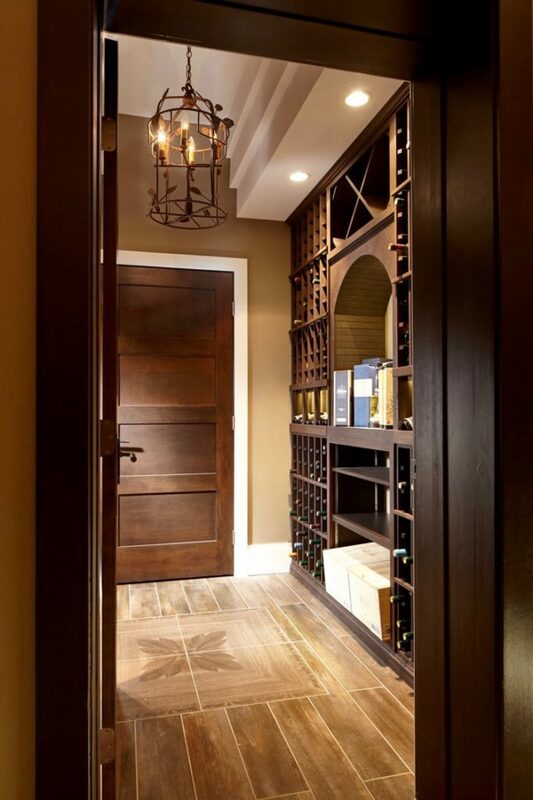 Coastal Custom Wine Cellars designed and installed the door for the Irvine home wine room. The residential wine cellar door was made of wrought iron and had impeccable design details of grape clusters and vines. The door was about eight feet tall and it had a stellar radius top. The door’s design is called “The Huntington,” which was originally drawn by one of Coastal’s clients in Huntington Beach. Many other clients fell in love with the design, and that is why it has been used many times in other wine rooms. 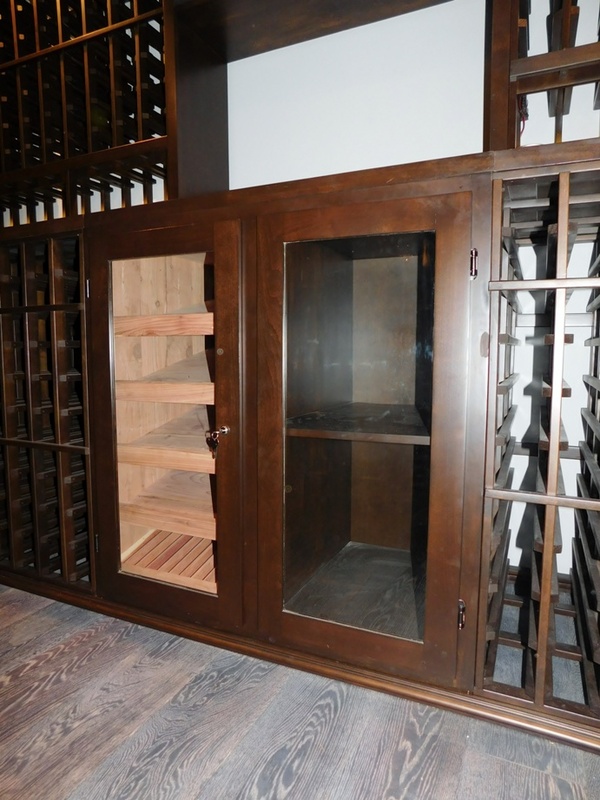 Coastal Custom Wine Cellars offers their clients a wide range of choice in door sizes, shapes, and styles. Their installation services include the setting up of the door’s casement moldings, dual pane glass, weather stripping, jamb, and self-sealing bottom. Want to find out the most popular wine cellar door design? Ask an expert builder now! Click here! Wine has to be kept in the ideal conditions in order to mature properly. The right temperature and humidity can be achieved if the storage room is built correctly. 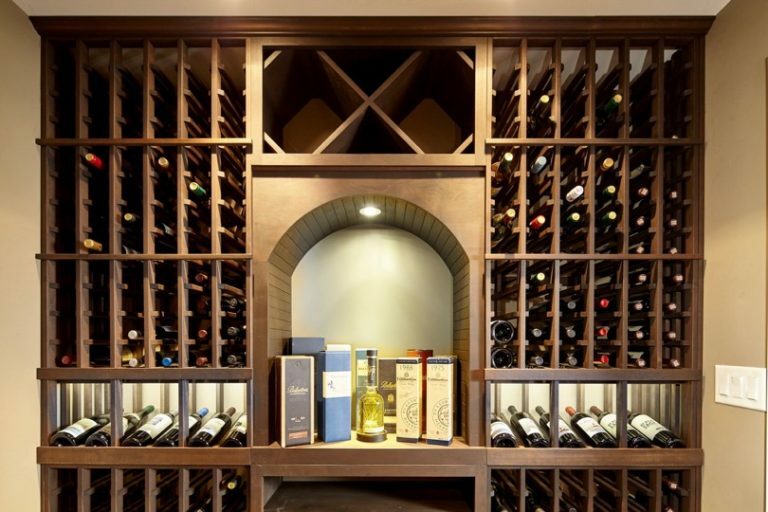 Coastal Custom Wine Cellars is a reputable wine storage construction company with over a decade of experience in building effective and efficient cellars. They offer construction services for both homeowners and businesses. Coastal is also well-known for consistently providing high-quality services. Learn more about Coastal Custom Wine Cellars, their products, and their services. Call them now at +1 (888) 735-8889! A wine cellar cannot function properly without the right components installed in it. A professional builder, who has the appropriate knowledge about proper wine storage and racking, can help you in your wine room conversion project. In Ramona, California, Vintage Wine Cellars has transformed an unused storage space into an elegant wine cellar. 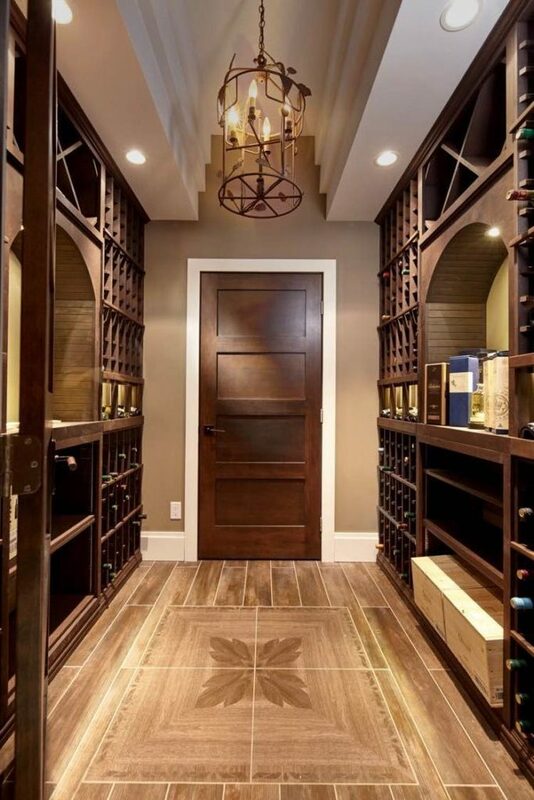 Check out the features of this wine room. The primary goal of your chosen builder must be to create a place that can maintain the perfect environment necessary for the proper maturation of wine. Poor storage conditions can affect wine’s quality. A well-built wine cellar must be able to maintain a stable temperature and humidity level that will preserve the desirable characteristics of wine for years to come. Your builder should also make sure that your wine rack system will display your collection impressively. 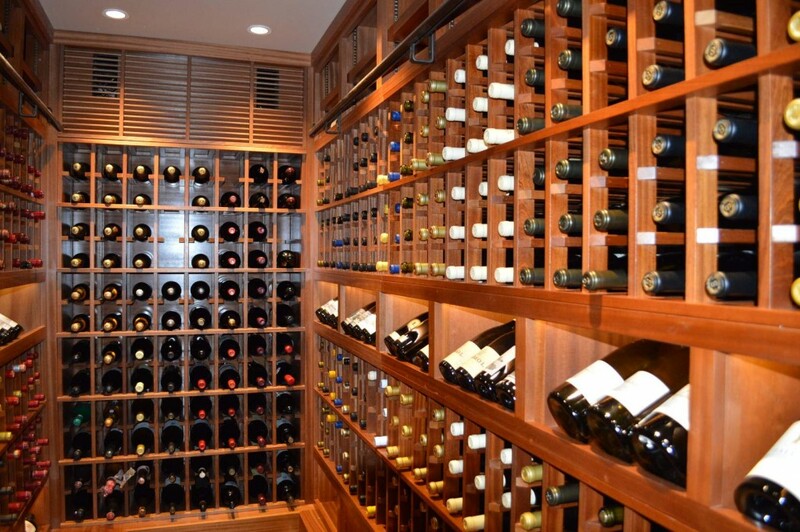 If you are a homeowner and a serious wine collector, investing in a climate-controlled wine room is a smart idea. It can increase the lifespan of your precious vintages and enhance the beauty of your home. Vintage Wine Cellars, a master builder in California, always makes sure that your wines are safe by installing the right insulation, cooling system, racking, and flooring in your storage space. Their design team uses their creativity and passion to create beautiful wine storage displays that will sweep your guests off their feet. 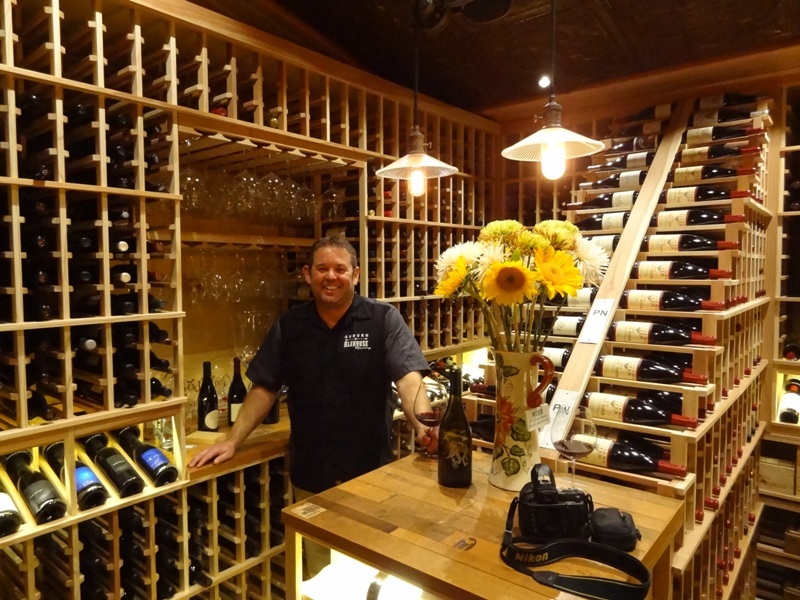 Recently, Vintage Wine Cellars has completed a construction project in Ramona, California. As a standard procedure, they first created 3-dimensional drawings before installing the essential components. These images showed the different elevations of the wine room, dimensions of the storage racks, and the bottle capacities. They started preparing the room after the client approved the drawings. The large room measures 14’x10’x8’. They added features that would maximize the storage space and allow for ease of cleaning of the wine racks. When designing their customer’s storage racks, Vintage Cellars California incorporates various racking configurations to create a display of wine that would capture the eyes of the viewers and add functionality to the home wine cellar. To maximize the storage capacity of the room, custom features were added. 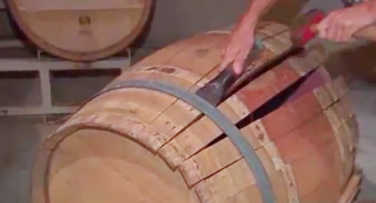 The entire racking was constructed from Premium Redwood, with wine barrel features. The left wall as you enter the wine cellar consists of double deep racking with a double-high stemware storage rack at the center. This feature allows the owner to store the wine glasses upside down. A tabletop was added to provide space for decanting and serving wine. Made from Fontenay wine barrel, the tabletop is an eco-friendly feature in the wine room. Reclaimed wine barrels can also be utilized to create other “green” features in California home wine cellars, such as flooring and storage racks. There is also a double high reveal display row on both sides of the tabletop, and in the middle section of racking on the rest of the walls. The top and bottom sections of the left wall have openings intended for storing magnum bottles individually. The back wall was originally a window made of glass. Vintage Cellars removed it and added the proper insulation. The back wall is the focal point of the wine room because it consists of a visually appealing storage unit – the waterfall display rack, which goes down to the center of the cellar. This type of racking stores the client’s magnum bottles in a cascading manner, leading down to a horizontal storage unit. The waterfall wine rack is double-sided for additional bottle slots. Above the horizontal display wine rack is another wine barrel tabletop, where the owner can serve and drink wine, and display other accessories. Like the left wall, the back wall also consists of double deep single racking and a high reveal display row, both for magnums. There was a dead space behind the waterfall wine rack, so Vintage Cellars decided to utilize it by adding case storage slots. This racking style allows for collectors who want to buy and store wines in bulk. The single-deep wine racks on the right wall consist of a high reveal display row in the middle section, with horizontal magnum storage openings above it. The top and bottom racking provide individual storage slots. Vintage Cellars always makes sure that every client’s wine room is constructed with proper insulation and a cooling system to keep wine safe. Proper insulation and installing the right wine refrigeration system will prevent a waste of investment by maintaining the perfect environment for the graceful aging of wine. Poor insulation can result in wine spoilage. 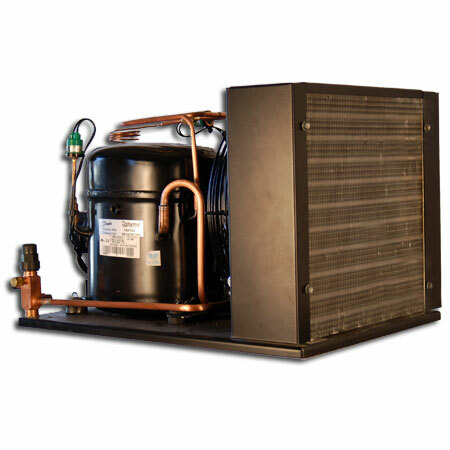 It will allow the warm air from the outside to interfere with the cooling of your refrigeration unit. Additionally, your wine’s quality will be damaged because the cold air will leak out of the cellar. When this happens, the chemical properties of wine will be altered, resulting in an unpleasant aroma and taste. Sealing a refrigerated wine room will also prevent moisture build up that can wreak havoc with the desirable qualities of your wine. The wrong humidity levels can cause bacteria and molds to grow in the ceiling, walls, bottles, and racking of your wine cellar. Hiring a professional to seal your wine room will protect not only your wine collection but also the structural integrity of your cellar. Additionally, your climate control system will have a longer lifespan because the warm air cannot pass through the walls, ceiling, and door. Warm air will force the equipment to work harder than it should and may result in higher energy consumption. Vintage Cellars used spray foam insulation in this wine cellar. 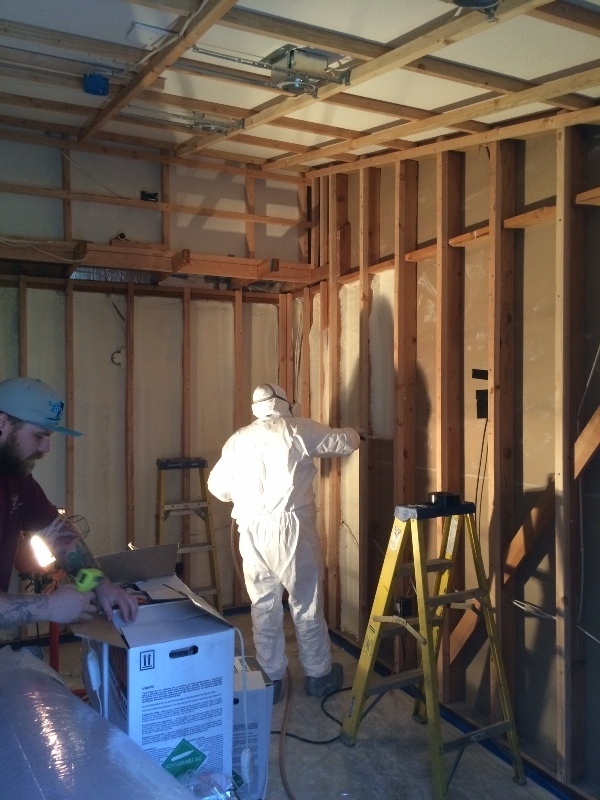 One of the advantages of this type of insulation is that it can also act as a vapor barrier. It eliminates the need to use plastic sheeting to wrap the entire room. 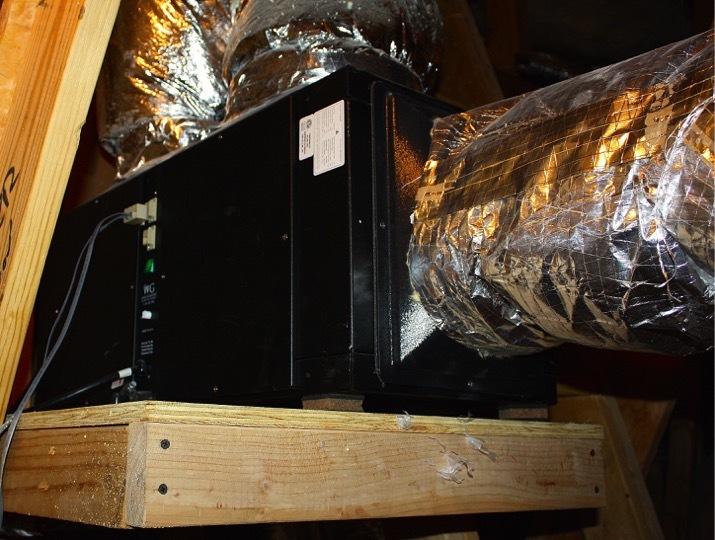 After the room had been insulated, Vintage Cellars installed a 1-ton split ducted cooling unit by Wine Guardian. The return vent and air handler were hidden in a soffit above the doorway. To maintain a quiet operation, the compressor was installed outside the cellar, and covered with a metal housing to protect the unit. For easy monitoring, the thermostat was placed on the wall right beside the door. 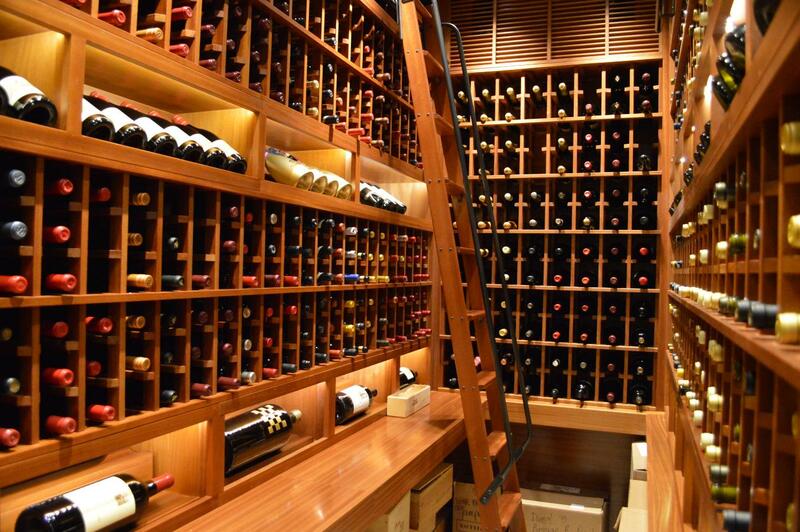 Your Dream Home Wine Cellar Can Be Yours. Contact an Expert. If you have a space that you want to transform into an elegant home wine cellar, Vintage Cellars California can help you. 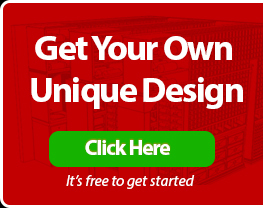 Call them today at 1-800-876-8789 or request a custom wine cellar design for FREE! Standard air conditioners don’t have the capacity to maintain a stable environment which is required for wine. A wine refrigeration system manufactured by a highly reputable company should be installed in your wine room to prevent damaging the quality of your wine. 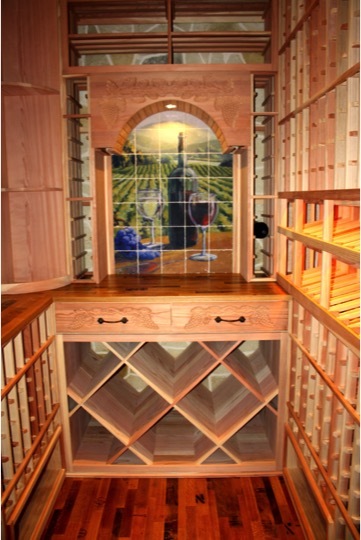 In California, Coastal Custom Wine Cellars used a CellarPro cooling unit in building a beautiful home wine cellar. Learn how they transformed a playroom into a wine storage display that has style and elegance, using custom features. On the 23rd of July 2015, Coastal Custom Wine Cellars began the construction project for a home in Anaheim Hills, California. The clients had a large basement where their children’s playroom was located. They wanted to transform it into a climate-controlled wine cellar using wood and metal racks. They also wanted to add a cigar humidor within the racking. Read on to find out how this was accomplished. Master wine cellar builders don’t just use a home air conditioning system for their client’s wine room. Wine easily spoils when it is kept in a poor environment. Coastal Custom Wine Cellars, a trusted partner of WholeCellar, have been using CellarPro cooling solutions in their projects in California, Maryland, and New Jersey. We work together to install the appropriate wine cellar refrigeration system to achieve the optimum storage conditions. At Coastal Custom Wine Cellars, it is their utmost consideration to preserve the quality of your wine until it is consumed because, for them, your happiness is their happiness. They take time and effort to prevent extreme changes in temperature and humidity levels which can ruin your wine. Imagine enjoying the complex flavor and aroma of the wine that has reached its peaked maturation in your refrigerated wine cellar. Coastal Custom Wine Cellars insulated the walls and ceiling to ensure that there was no air leakage to or from the wine cellar. With proper insulation, wine storage problems can be avoided. Additionally, it will prevent the cooling unit from working harder than it should. Meaning, creating an airtight seal will not only protect the wine’s quality, but can also help reduce energy consumption. In this installation project in Anaheim Hills, California, Coastal Custom Wine Cellars conducted a heat load calculation to analyze the BTU (British Thermal Unit) requirement because the room had to be enclosed in glass and it is nearly 1,300 cubic feet. In running a heat load, temperature changes and the size of the room must be considered. They used the CellarPro 8000S ductless split wine cellar cooling system. The wall-mounted evaporator was placed inside the cellar while the condenser was placed outdoors. To protect the condenser from weather conditions, they added an exterior housing. Seamless glass walls and door are recommended for collectors who want to have a good view of their wines from outside the cellar. 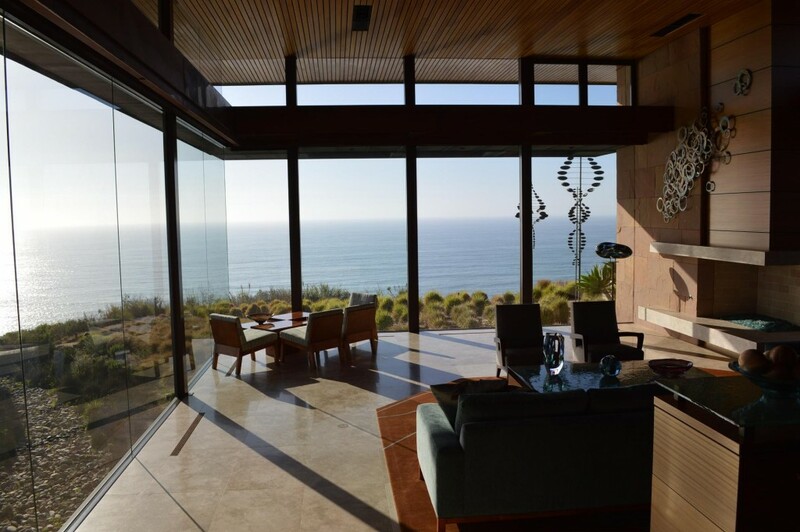 Additionally, glass panels also add a modern appeal to any living space. Coastal Custom Wine Cellars used tempered glass panels, and they had to install the frameless glass very carefully to create an airtight seal around the door. 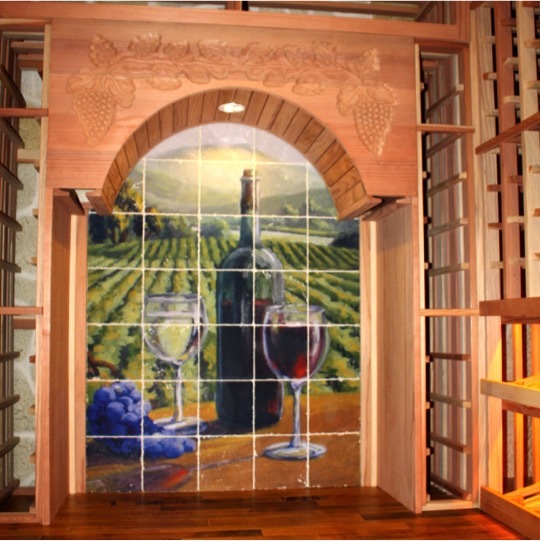 Coastal Custom Wine Cellars offers a free 3-dimensional design package. These drawings include the perimeter of the room, different elevations, plan views, and bottle capacities, which allow the owner to visualize their dream wine cellar before the build begins. For this room conversion project, they have designed a wine rack system that can store up to 2,055 bottles. On the wall where the door is located, they installed floor-to-ceiling height metal storage racks from Vintage View. This section can hold up to 852 bottles. One of the advantages of using Vintage View metal wine racks is the convenience in finding a certain type of wine because they display the bottles in a label forward orientation. You don’t need to pull out a bottle just to see the label. The open airflow design of these wine racks distributes the liquid temperature more efficiently. The metal wine rack system is recommended for those who want to achieve a contemporary appeal in their California home wine cellar. When you enter the room, you will see that the left wall starts with a quarter round display wooden wine rack. This storage unit has five shelves, which provides an excellent storage place for some of the owner’s favorite vintages and wine accessories. The next set racking consists of diamond bins at the bottom. The top section has a tabletop for decanting and serving wine. The back wall is where the core racking was installed directly across from the metal racks on the glass wall. Coastal Custom Wine Cellars combined various orientations to add character to the overall design. The top section stores the bottles individually. The center of the back wall racking has an open area. It provides a space for the wine glasses, where the owner can hang them upside down in a stem rack. 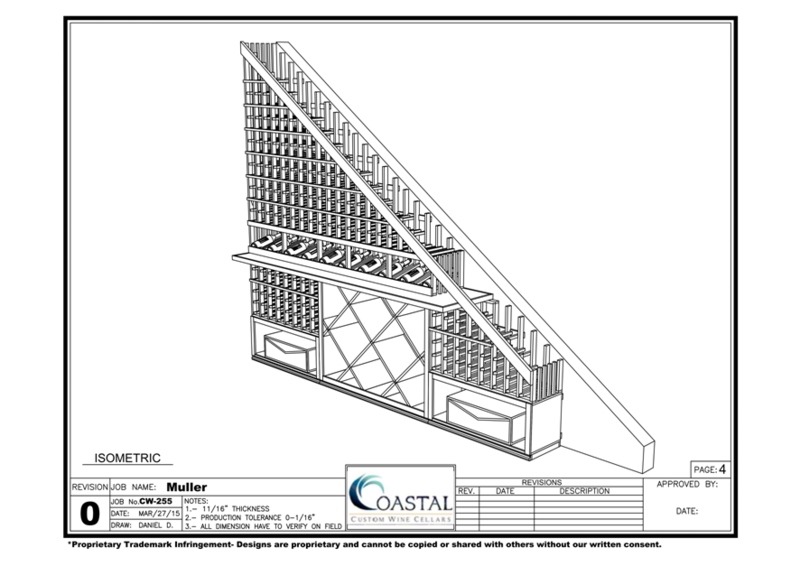 This design allowed Coastal Custom Wine Cellars to hide the evaporator that was used to cool the playroom. Both sides of the open area consist of a display row with lighting. The bottom section has double-deep wine racks with a tabletop for decanting wines. Most of the openings are intended for 750ml bottles. Both sides of the bottom racking consist of a double-deep wood case storage. The double-deep cigar humidor cabinet is located just below the open area at the center of the back wall. Unlike California home wine cellars, which require about 55-65 degrees Fahrenheit to preserve the quality of wine, cigar humidors need a warmer environment. Therefore, they installed weather stripping on all sides of the cabinet door to achieve a bit higher temperature in it, about 70 degrees. Coastal lined the humidor with Spanish Cedar because this wood variety can help create a higher temperature and humidity level in the cabinet. Coastal Custom Wine Cellars created a 4-level tray on the left cabinet. The lowest level has a tray for displaying the owner’s cigars individually. On the right is a standard cabinet where other items can be displayed. Planning to Convert a Room into Your Dream Wine Cellar? Seek the Help of an Expert. If you have a room that you want to transform into an attention-grabbing wine cellar, contact Coastal Custom Wine Cellars at +1 (949) 355-4376 or request a custom design for free. Are you thinking about investing in a wine cellar but do not have dedicated space? Worry no more! Wine Cellar Specialists can build your dream wine room in a small space. In their recent project, they converted a tiny room into a sophisticated wine storage display. 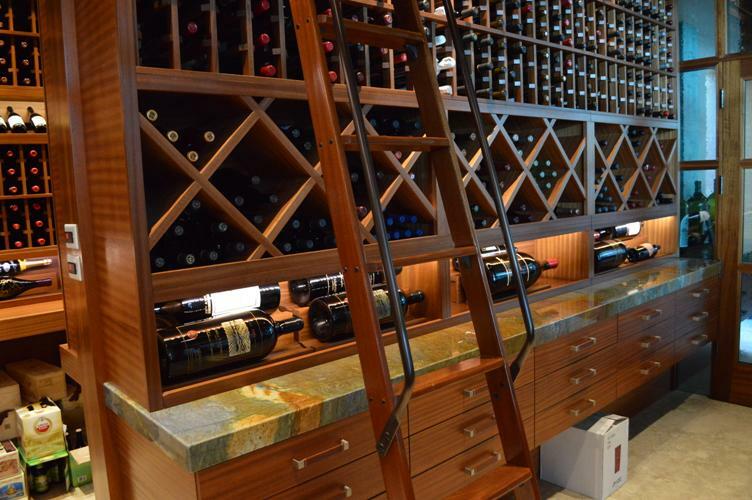 Learn more about the custom features of this Texas home wine cellar. Limited space is one of the common problems faced by many wine lovers who desire to build a functional wine room in their home. Traditionally, wine cellars are located in basements to provide wine a cool environment necessary for aging. Nowadays, a refrigerated wine cellar can be installed almost anywhere in your home such as the garage, closet, or under the stairs. 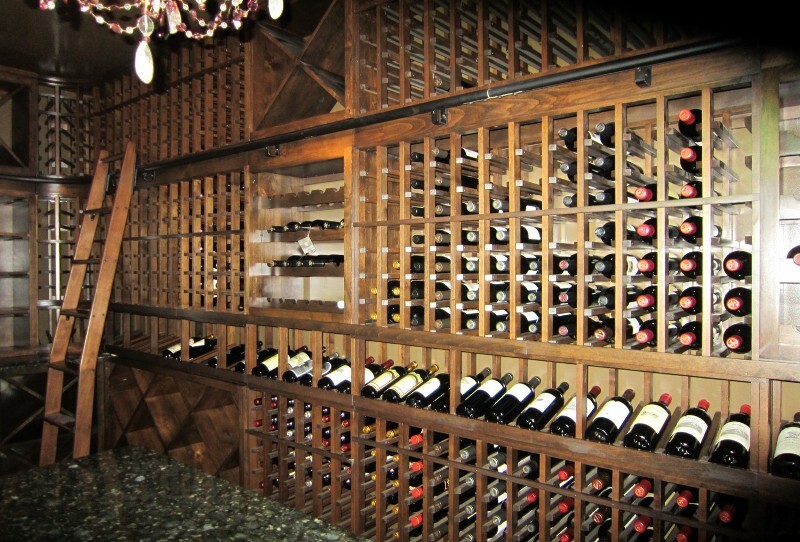 An expert in wine room construction can provide a turnkey solution to the unique requirements of their clients. Wine Cellar Specialists, a master builder in Texas, completed the installation of an attractive wine storage facility in Colleyville. They have been our partner in wine cellar construction for many years. They offer products and services that suit the unique needs of every wine enthusiast. 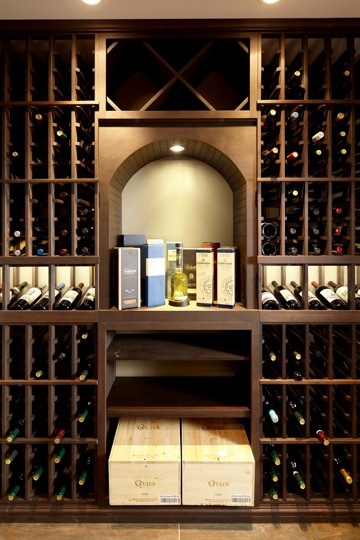 Wine racks are not only storage units for one’s wine collection, but are also one of the factors that affect the overall appearance of a Texas home wine cellar. For these reasons, your wine racks must be manufactured using durable and appealing materials. Additionally, they must also be designed with functionality and creativity. In this wine room conversion project, Wine Cellar Specialists designed and installed the wine racks, refrigeration system, door, flooring, walls, and ceilings. They took into account many factors to ensure that everything suited the room’s location and size, and the client’s personal preference and budget. There are important considerations in creating a wine rack design. Wine Cellar Specialists spent quality time to know the aesthetic and functional requirements of the homeowner. They used racking styles and included custom features that would suit the mood that the client wanted to achieve. The design was also created according to the number of bottles intended to be stored in this Texas wine cellar. Known as a top-notch wine cellar builder, the team of Wine Cellar Specialists always sees to it that every design they create is incorporated with bottle orientations that create elegant and unique wine display. In this project, they combined different wine rack styles to achieve this. The left sidewall has three rows of single bottle storage slots at the top section. Below this racking are two display rows. The first row is a low reveal display and the bottom row is a high reveal display. LED tape lighting was installed above each display row. On the left of the individual wine rack is a window between two half-height, quarter round display racks. These quarter round storage units sit on a tabletop located below the window to the kitchen. The tabletop is made of engineered planks from reclaimed wine barrels. Two case storage bins and more single bottle storage racks were added to the bottom section of the left wall. Just like the left wall, the right wall also consists of two display rows in the middle section. Additional slots for individual bottle storage were added to the top and bottom sections. The focal point of this small, yet beautiful wine room is the wine rack at the back wall. Wine Cellar Specialists used an elegant solid arch incorporated with a grapevine design. They added a glass rack and slots for magnum bottles on both sides of the arch. As an additional custom feature, they also added a tumbled marble tile behind the arch. The tile matches the classic appeal of wooden wine racks. To add functionality to this Texas wine cellar, they installed another reclaimed wine barrel tabletop with two drawers below it. 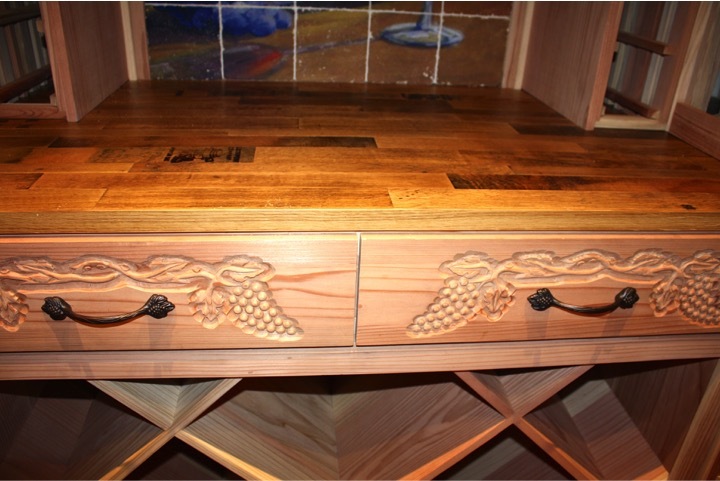 The drawers were also carved with a grapevine design on the front to match the solid arch. Each of these drawers has a handle pull equipped with a European style self-closing slide hardware, which came from the Vineyard Collection hardware of Wine Specialists. The bottom section of the back wall was installed with a diamond solid bin wine rack. This type of rack is ideal for storing wines in bulk. In addition to the design of your wine rack system, another factor that helps achieve an appealing wine storage display for a home is the material used to construct your wine racks. 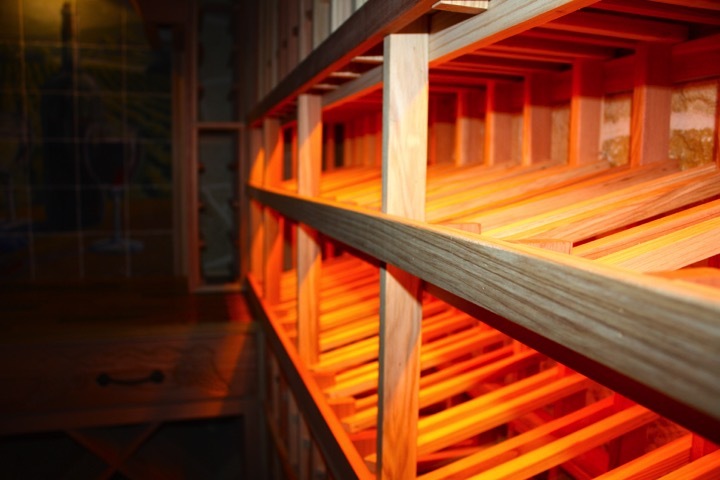 Wood and metal are the most widely-used materials in manufacturing wine racks. Most wine cellar builders recommend the wooden wine racks for residential owners who love the classic appeal of wood. Wooden wine racks are not only beautiful, but durable as well. 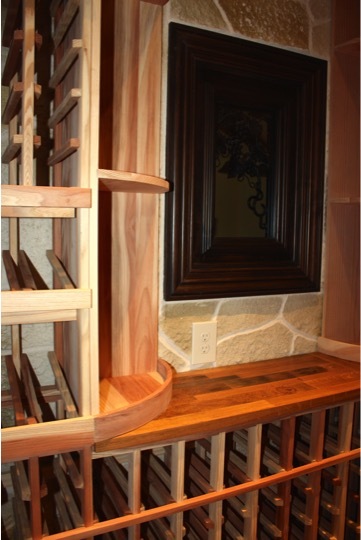 In this conversion project, Wine Cellar Specialists used Premium Redwood for the wine racks. This wood variety exhibits a reddish color with streaks that add character to the wine racks. There are many factors that can help achieve the ideal environment needed by wine to age properly. One of these factors is the wine cellar flooring, which should also be chosen carefully for aesthetic and functional purposes. Wine Cellar Specialists always recommends the addition of an eco-friendly feature in their client’s wine room. In this project, they used Cooperage flooring. 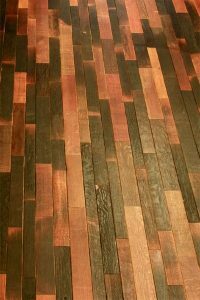 It is a style of flooring, which makes use of reclaimed wine barrels. 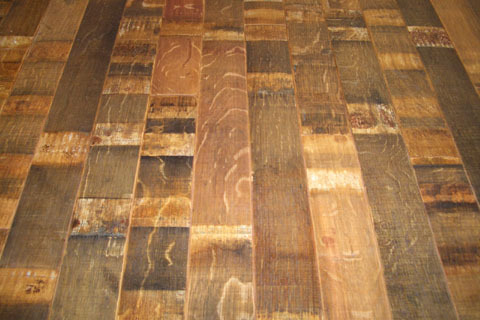 In this style of flooring, the wood pieces come from the top and bottom sections of used barrels. The wooden planks are engineered to create flooring that displays the unique stamps and markings of the barrels. Just like the walls and ceiling, the flooring was installed with the proper insulation to prevent warm air from mixing with the cool air inside the wine cellar. Proper insulation helps regulate the conditions in wine storage facilities. 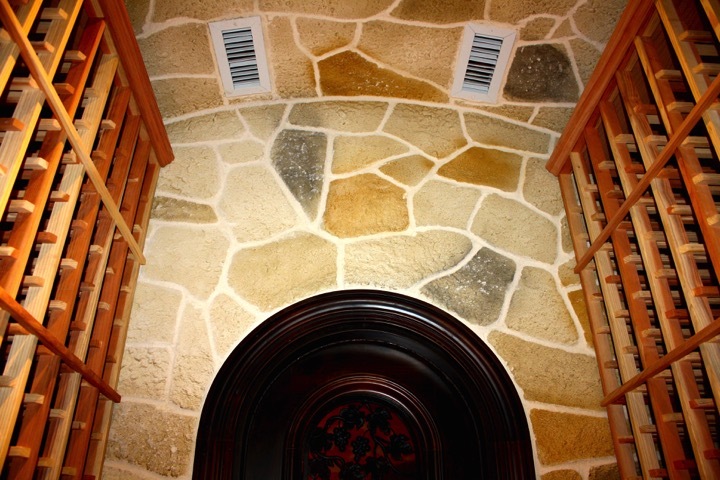 Another feature that makes this Texas home wine cellar stand out is the Stonecoat design on the walls and ceiling. Stonecoat is a material made of crushed limestone from France. To create a gorgeous stone effect, the material is blown onto the surface and hand carved. It is then colored according to the client’s preference. 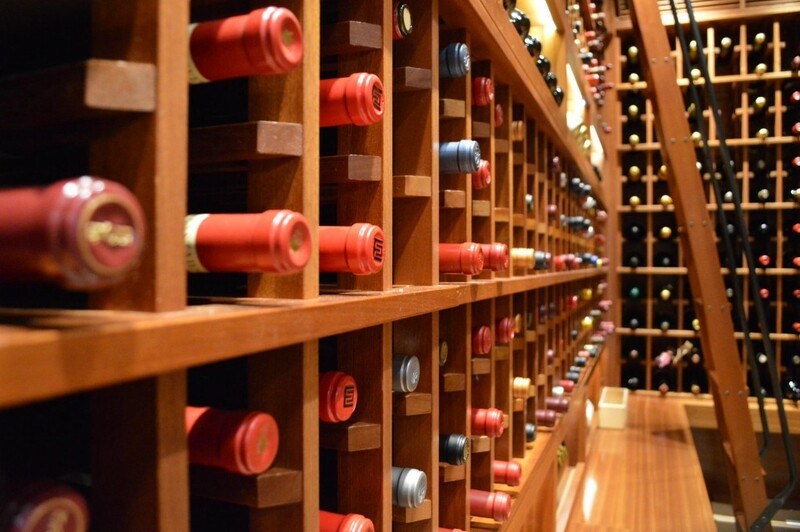 The most important component of a wine room is the cooling system. Its function is very important in helping wine achieve proper maturation before it is consumed. 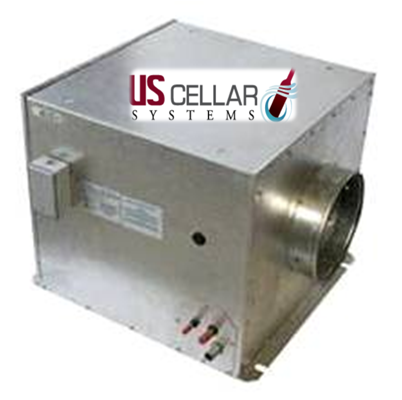 Wine Cellar Specialists used a ducted self-contained wine cooling unit by Wine Guardian. It was placed in a conditioned space in the attic, creating minimal noise. Make Use of Your Tiny Space at Home. Work with an Expert. A tiny space should not stop you from building a Texas home wine cellar. If you need help, please feel free to contact Wine Cellar Specialists at +1 (866) 646-7089, or request a 3D custom design for FREE! There are projects that the Whole Cellar team is particularly proud of, not just because of how they were able to implement it, but because of the difficulty they experienced in achieving that perfect job. The Playa Vista wine cellar under stairs project is one of those jobs. Why was it singled out among the many projects the team completed, you might ask? 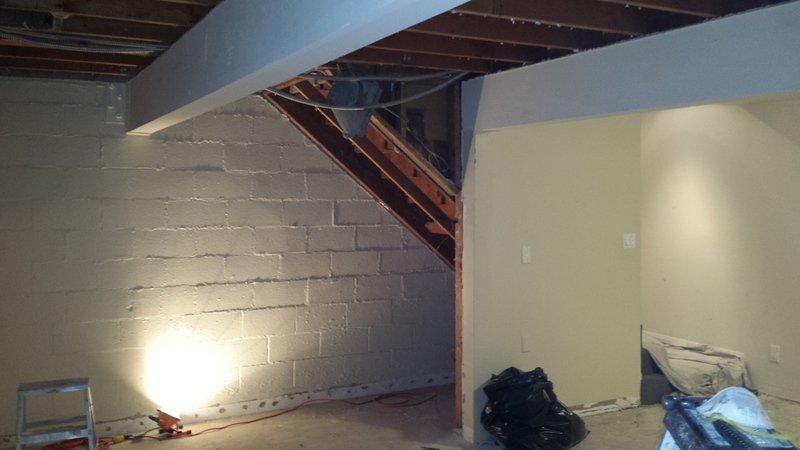 Well, it has to do with the “unusual” wine cellar area proposed by this client to be turned into a wine cellar: underneath the stairs of his house. Yes, the picture you are seeing above really was the area where he was asking the team to set up a wine storage area in his home. As you can imagine, there were a lot of structural hindrances that the team had to consider before drawing up a plan for the project in the first place. But hey, Whole Cellar did not win the Best of Houzz 2015 awards for nothing; the team is well-accustomed to accepting challenging jobs that require a high quality of craftsmanship, and the Playa Vista project proved no different. Read on to discover how they took up the challenge; the process is documented below! Even though this was the first time the client had requested that contractor provide him with a wine cellar, he had an impressive knowledge of wine storage principles that he was already portraying. For one, he already owned a standalone refrigerated cabinet by Le Cache, and he knew that a standing temperature of 57-degree Fahrenheit was needed to ensure that his fine wine collection matured properly. Of course, it just so happened that the space underneath the stairway was the only place available for this purpose. 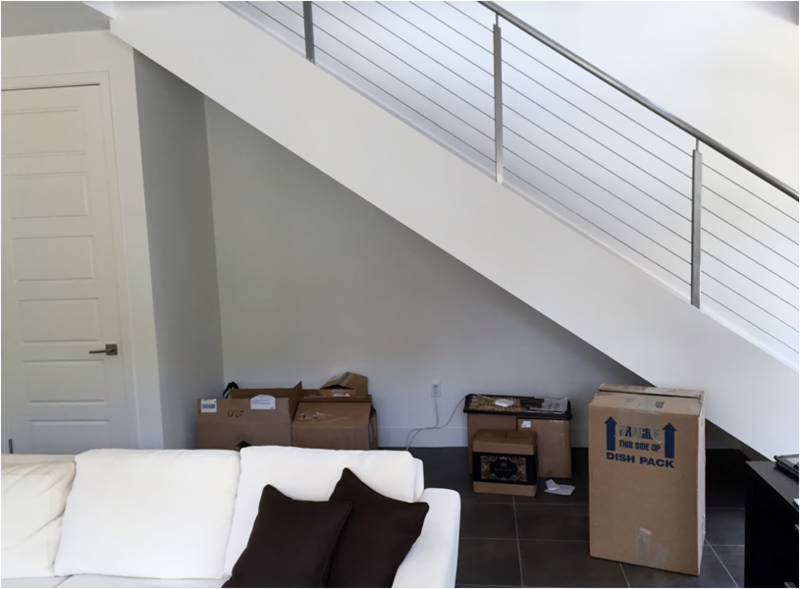 Los Angeles Home Wine Cellars – Playa Vista Project Wine refrigeration systems can be notoriously bulky. The original idea of making a glass wall enclosure–on which the front of it was supposed to be refrigerated–in the area underneath the stairs was quite improbable for this project. And, not to mention, very costly too. However, since the client already owns a single refrigeration system, the team suggested he move 200 of his fine wine bottle collection to the Le Cache refrigerator and leave the rest of his collection to be stored “passively”–that is, to be put inside the wine cellar for the sole means of displaying it to visitors. The client agreed to the idea, and then the team set about designing the wine racks that would be used for the cellar. This is the Playa Vista under the stairs wine cellar project before completion. As you can see from the picture above, the Whole Cellar team had to account for the slope of the stairway above the area, in order to design the wine rack accordingly. They also decided to include some “elements” from popular wine rack designs like diamond bins and rectangular storage bins to create a custom wine rack that is truly one of a kind. 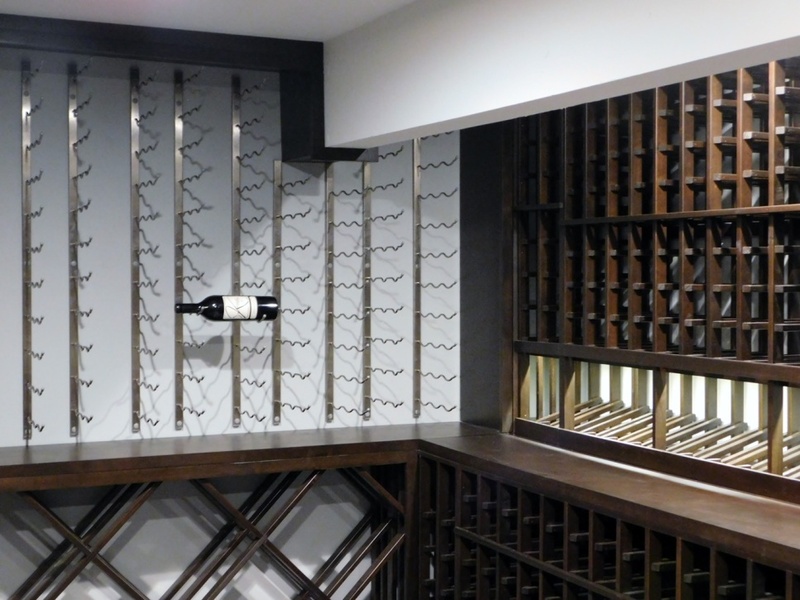 Since one of the main purposes of this wine cellar project was to display the client’s wine bottle collection, having a high-reveal display row was of the utmost importance for the rack. Pitched at a fifteen-degree angle, this angle afforded the wine rack a sleek and thoroughly modern look. All openings in this wine rack were also made to be “universal”; in other words, it has been designed to be wide enough for just about any large wine bottles like champagnes or burgundies to be stored inside it. A modified countertop was also included in the design of the wine rack so as to allow people a simple “table” where they can set wine bottles or glasses, in case they would like to have an impromptu wine tasting session. Finally, the wine rack came in an Alder wood design, and it was finished off with a rustic stain look that perfectly matched the flooring in the rest of the house. The client was very pleased with how the Playa Vista wine cellar under stairs project turned out after three months of hard work. If you have a similar idea in mind, but do not know how you can go about it, then you can always call Whole Cellar’s toll-free number at +1 (888) 735-8889 and get a FREE 3D wine cellar design! This is the finished product of the Playa Vista California wine cellar project. It requires an expert in wine cellar design and installation to create a wine storage facility that will impress and meet all the requirements of the owner. 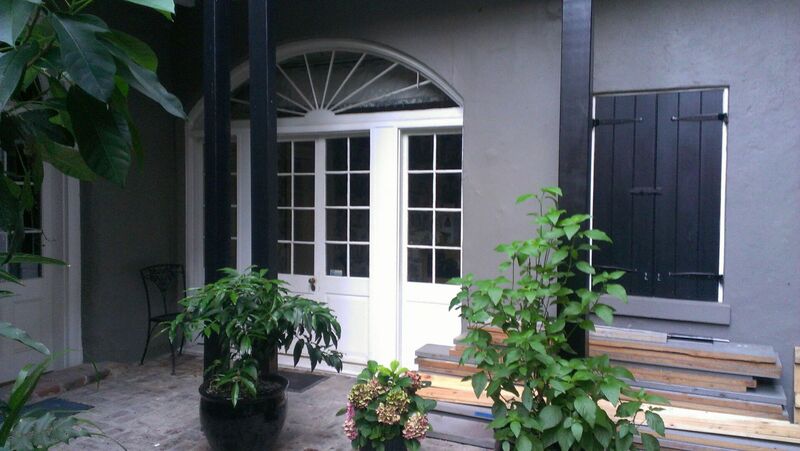 In New Orleans Louisiana, a local contractor needed to renovate a wine room. The space was previously used as a carriage house in one of the mansions in the French Quarter, the oldest neighborhood in the city. They sought the help of Wine Cellar Specialists, who partners with WholeCellar in building custom wine cellars. New Orleans is a city in Louisiana where you can find its most famous neighborhood called the French Quarter. Known as a prime destination in the city, the French Quarter is home to hotels, restaurants, bars, residential, and tourist-oriented commercial properties. 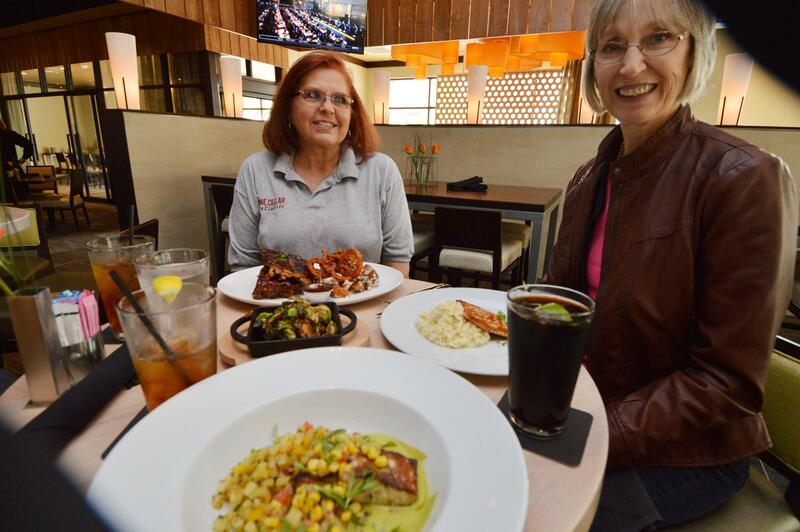 It is an ideal place for people who love to enjoy excellent food and fine wines. In addition to enriching the wine tasting and dining experiences of its visitors and local residents, the French Quarter is also an ideal place to enjoy a leisurely walk while viewing the architecture built in the late 18th century. A carriage house in the historic mansion had to be renovated to build a refrigerated wine cellar. 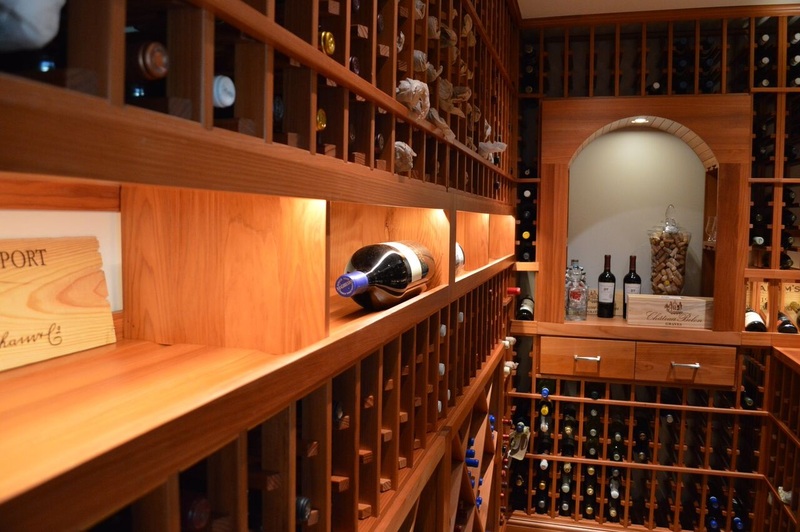 A local contractor sought the help of Wine Cellar Specialists. 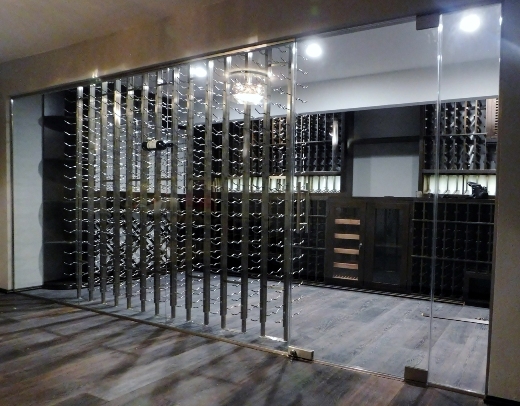 WholeCellar has collaborated with Wine Cellar Specialists in many of their installation projects. 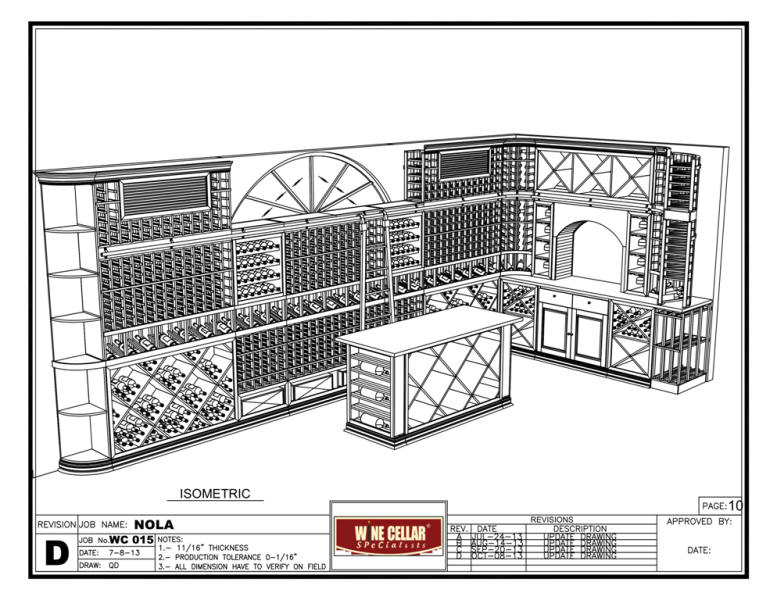 Wine Cellar Specialists created the design for the New Orleans Louisiana custom wine cellar. They also provided the cooling system, wine racks, door, lighting, ladder, rails, and the glass window. They also made a careful assessment of the client’s needs to ensure that the wine room meets all the functional and aesthetic requirements. 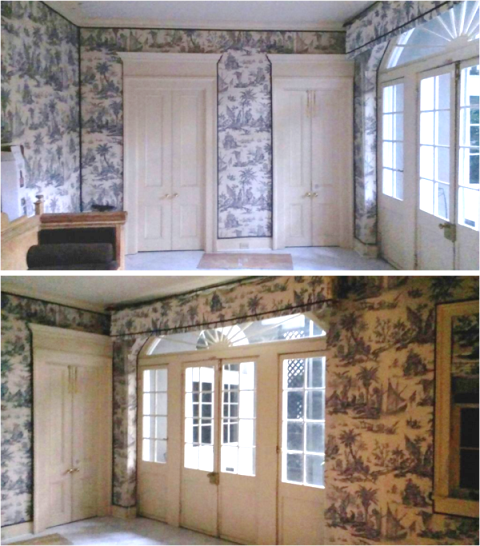 Before the installation started, the carriage house used to have two entryways. The left door was the entrance to the carriage house, and the right door was the entrance to a bathroom. The room also had a wall with rectangular windows in the lower section, and a large sun-shaped glass window at the top. Whatever the size and shape of the room that needs to be renovated, Wine Cellar Specialists can create a stunning wine rack design for their client’s collection. There may be space and/or financial challenges that may not be avoided during the planning and construction stages, but nothing can hinder an experienced and creative team to build an impressive wine display. 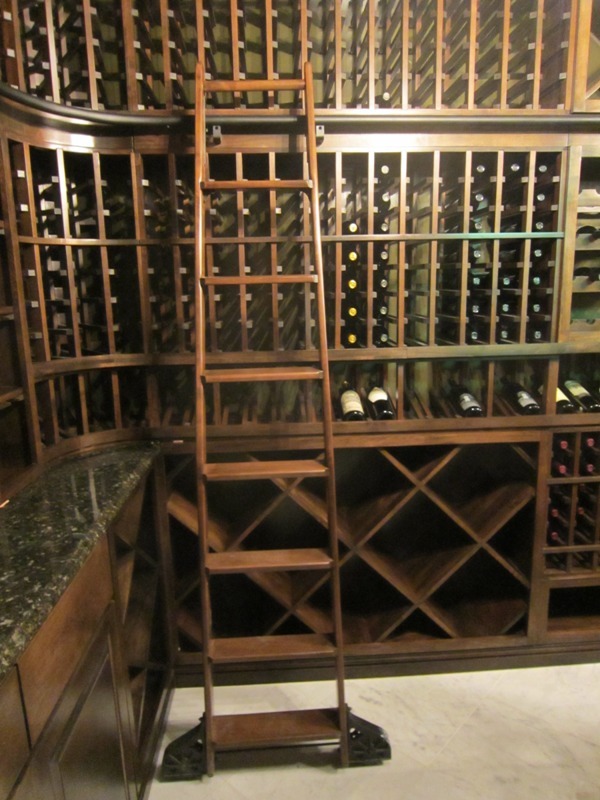 Wine Cellar Specialists designed the wooden wine rack system to accommodate about three thousand bottles. They used different combinations of racking styles to create a sophisticated display while maximizing the storage space. The left wall is the wall where the rectangular windows were located. The bottom section consists of diamond bins, individual racks, and case storage bins. The upper racking also has individual storage slots, and two sections of French style wine racks. Centered above it is a large window with a sunburst design made of antique green glass. Built within the racking, a grill cover and box on both sides of the window were added to hide the twin evaporators. Wine Cellar Specialists incorporated a high reveal display row that lines the middle section of the left and right walls. This configuration highlights some of the fine wines of the collector. The light valance for the led strip lighting was placed above the display row. 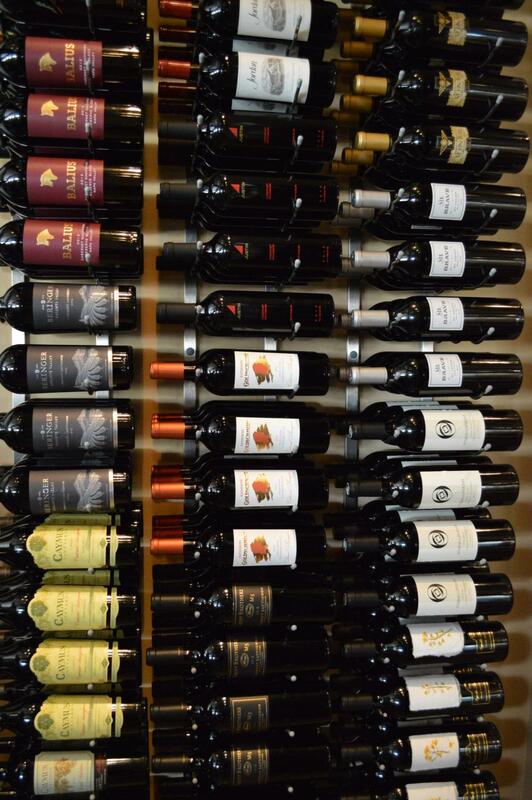 The right wall wine racks have the same configurations as the left wall. The only difference is that the right wall has no glass window, only more slots for individual bottles and additional two X bins. The center of the back end wall was installed with two drawers, with cabinet doors below them. Both sides of the cabinets are double deep X bins intended for bulk storage. The cabinets come with an adjustable shelf inside, and the drawers are self-closing. The installer provided the granite countertop above the drawers. Above the drawers is an eye-catching solid arch with puck light. Glass racks were added to each side of the arch. The racking is finished off with a solid quarter round wine rack at the door wall. 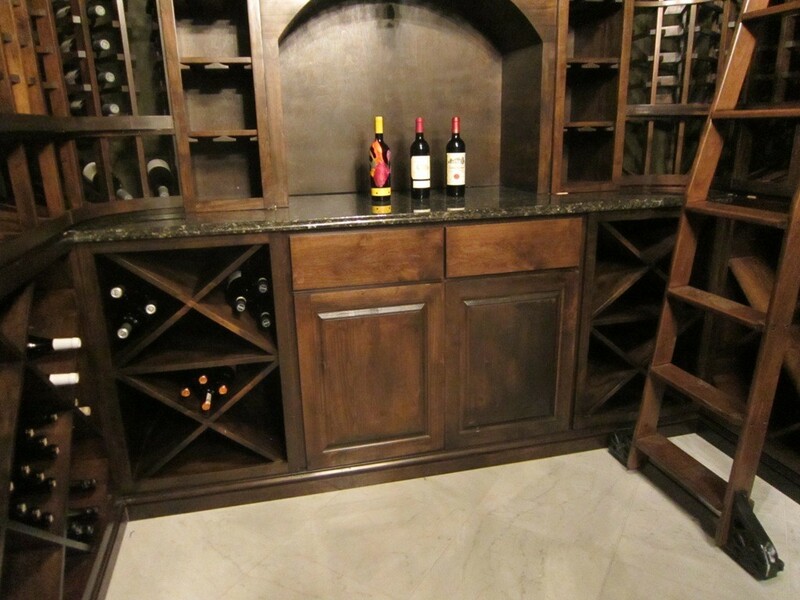 Another beautiful feature of this New Orleans Louisiana custom wine cellar is the center island. To maximize the storage capacity of the room, Wine Cellar Specialists included horizontal display racks on both ends and solid diamond bins on both sides. The horizontal display racking can house standard 750ml or magnum size bottles. Like the counter top at the back wall, the granite table top for the center island was provided by the installer. Rolling ladders, which are also known as library ladders, are in demand in wine cellar construction. For many homeowners, a rolling ladder is a great addition to any wine storage facility. Its role is to allow the collector quick and convenient access to bottles stored high above the racking. With a rolling ladder, you don’t need to climb up a chair or stool to get hold of a bottle beyond your reach. There are two types of rolling ladder: straight and bent. For this project, Wine Cellar Specialists used a bent rolling ladder. It is ideal if you have double deep wine racks at the bottom section of your racking. It comes with hook assembly and sunburst wheels. The matte black rails, which line the whole racking, are attached to a solid wood. The material used for the wine racks contributes to the overall look of the room. 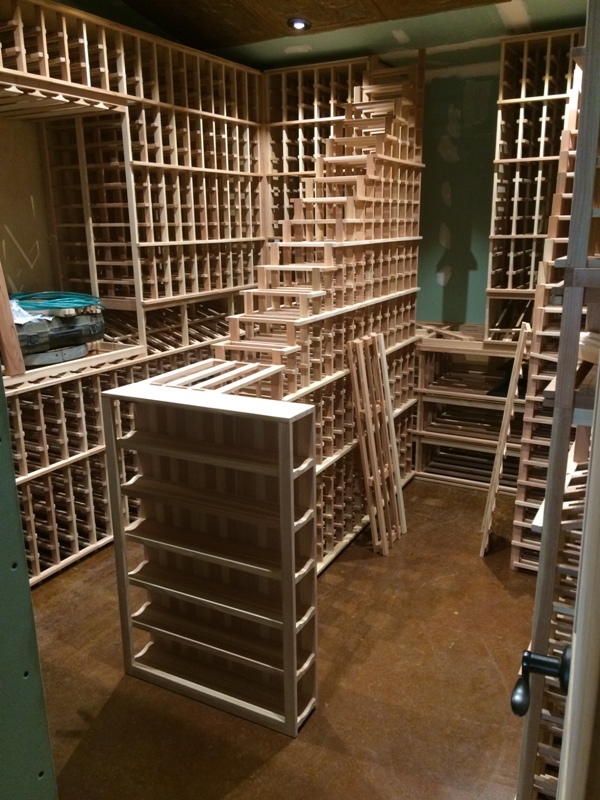 For this wine cellar installation project, the wine racks were constructed from Knotty Alder. This type of wood is known for its rustic appeal. 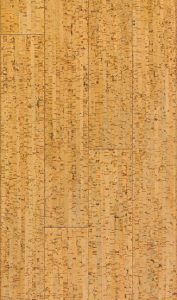 Additionally, Knotty Alder is recommended for wine cellars because it has the ability to withstand extreme changes in conditions. Other properties of this wood that make it a favorite of master builders include its natural beauty, durability, and high resistance to warping. Need a Master Builder for Your Renovation Project? Wine Cellar Specialists is a trusted master builder in New Orleans Louisiana. If you need help in your next project, contact them at +1 (866) 646-7089 today!